Betsey's love of antique textiles overflows the limits of our categories! This is where you will find unique pieces that are special enough to offer to you. As with all of our other pieces, these vintage antique textiles are guaranteed for authenticity, condition and age. Click on the pictures below to see more views of my Unusual Finds. Shading is due to lighting, not representative of the quilt. Please call for the availability or any questions. An affluent woman's sewing table from the mod 19th century. At that time most hand work of ladies of stature was done on their laps using a wooden hoop. 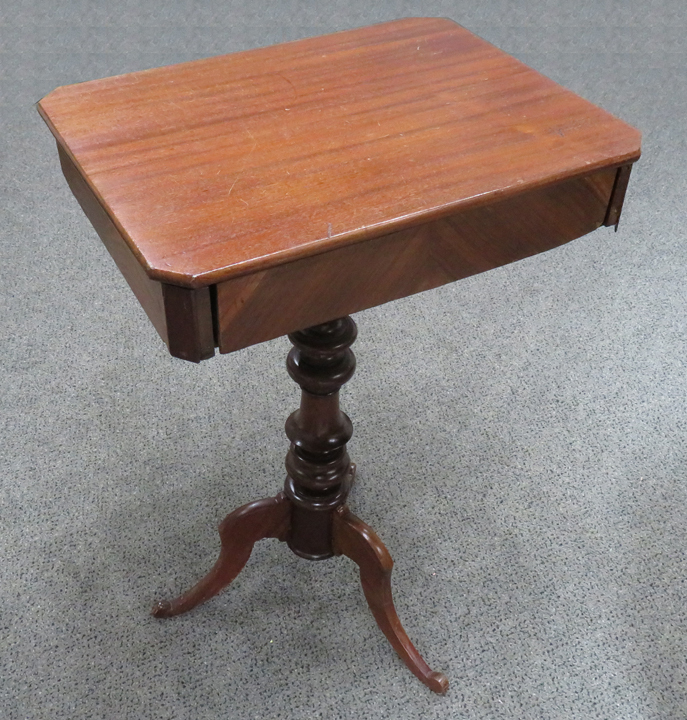 This table would hold all their thread, pins, needles and other sewing tools of that era. Today this becomes a beautiful accent table with history. Do you have either an original or reproduction early American bed? This textile is usually only found in historic books, museums or antique homes that one would tour....maybe even earlier than I am dating it. This extraordinary and rare Candlewick Spread is almost 200 years old. Because of the age, one can understand why there are so few of these in existence. Created with cotton thread on a very fine linen fabric; the handwork is breathtakingly beautiful. The body of the spread is in perfect condition. The fishnet edging needs some restoration, which we can do. At this point I have only hand washed it. The seams are joined with a running back stitch which is so tiny that at first glance it appears to be done on a sewing machine. Early hand work such as this was never meant to come apart...hence the running back stitch that can easily be mistaken for machine work. I needed to use a magnifying glass to verify this stitch. This incredible bed covering was made 30 years prior to the invention of the sewing machine. When quilts and spreads were made from this era, this sturdy stitch was used to join seams. We were not a throw away society back then and things were made to last forever. This stitch holds seams firmly together. I have taken clothing apart to use for restoration and sometimes come across this stitch. 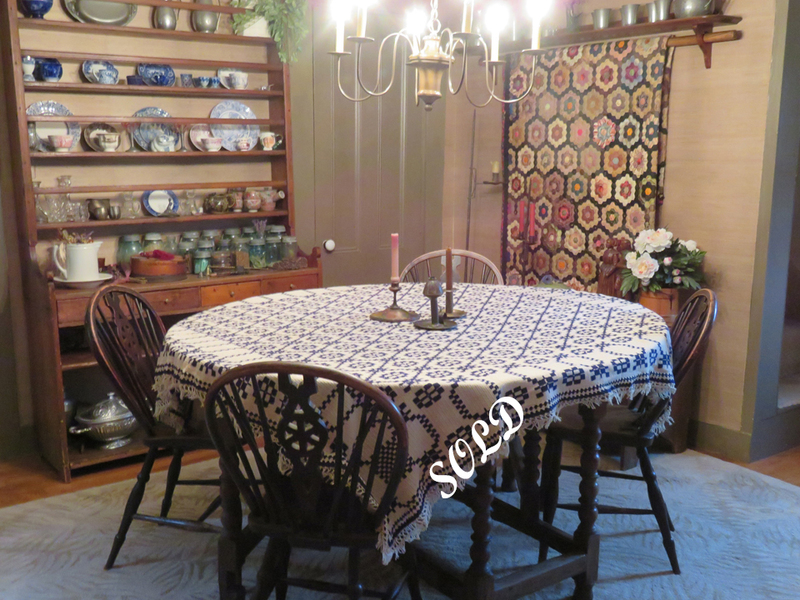 This early New England Spread has been organically hand washed and is ready for viewing in your home. 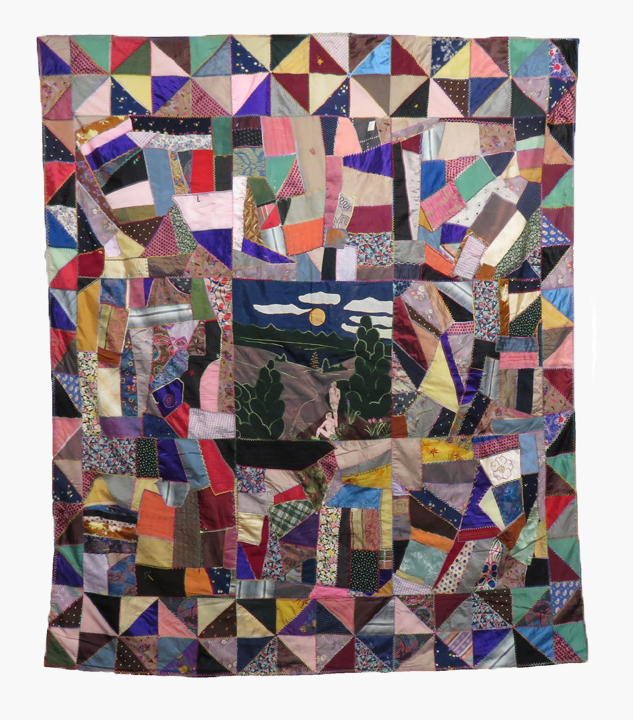 This unusual silk crazy quilt has a center panel with an original adaptation of Adam and Eve depicted in the western part of the United States. The center medallion panel measures apx 22” square and is surrounded by eight crazy quilt blocks each also 22" square. The perimeter of the quilt is constructed using the broken dishes pattern which also creates a windmill pattern. The two side borders measure apx 4-1/2” each in width. The bottom border measures apx 10” in width. The whole cloth backing of the quilt is an early 20th century print. Each silk piece is outline quilted with various Victorian stitching embellishments. The edging is pillowcased and then finished with an embroidery stitch created using various colors. The thread used for all embellishments is a silk embroidery twist. A rare and unusual piece of folk art for a special wall. Please ask for more details. Overshot coverlets were another textile, in addition to quilts, used to keep warm in our cold climates. 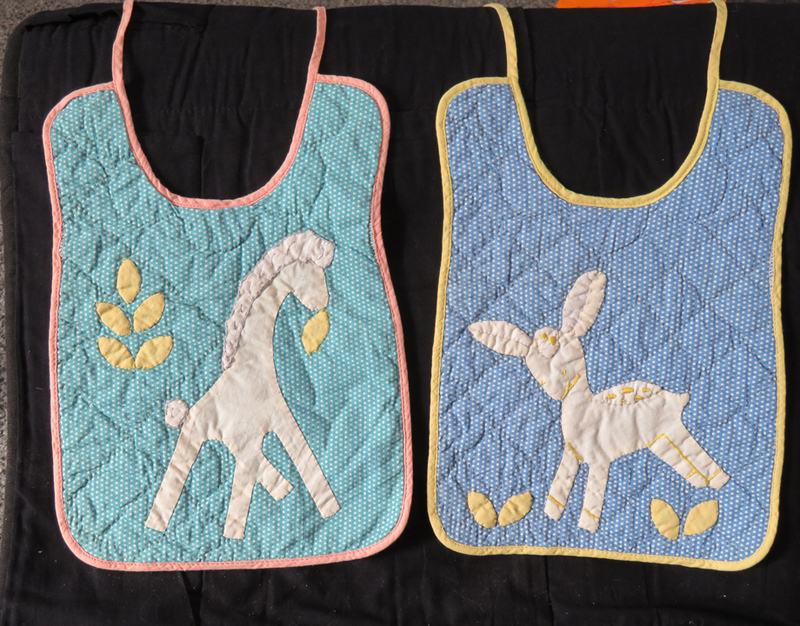 The early coverlets were woven from homespun wool and homespun thread. After the civil war women were more likely to purchase the wool and thread for weaving. The coarse wool, used here, was home spun, undoubtedly from the creator's sheep. 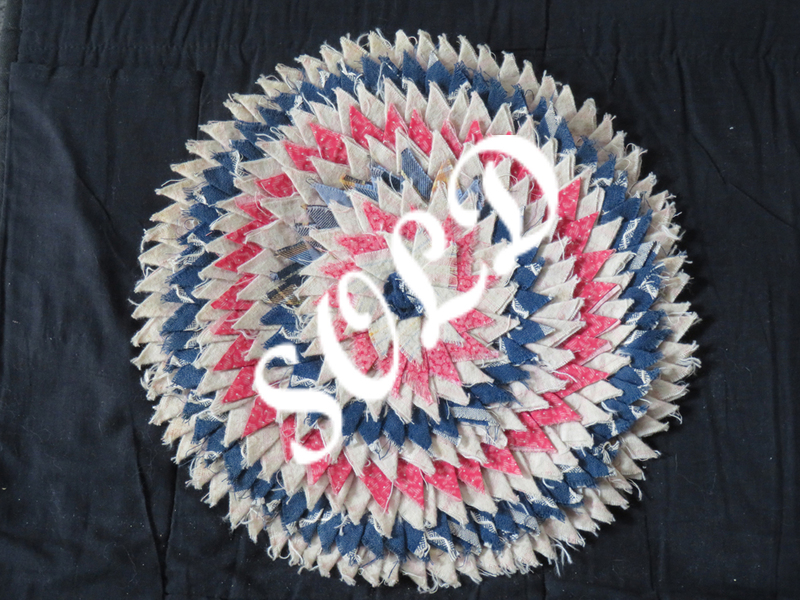 This coverlet was made using a large loom. There were at least two sizes of looms: One loom size was narrow (usually around 39” in width); with this loom, for a coverlet, you would make long 2" strips and sew them together. The other method was a large loom, which is what was used for this antique textile. Up until recently there was a wonderful textile museum in Lowell, MA where one could actually see these looms. Unfortunately, due to cuts in budgets for the arts, this museum has closed. 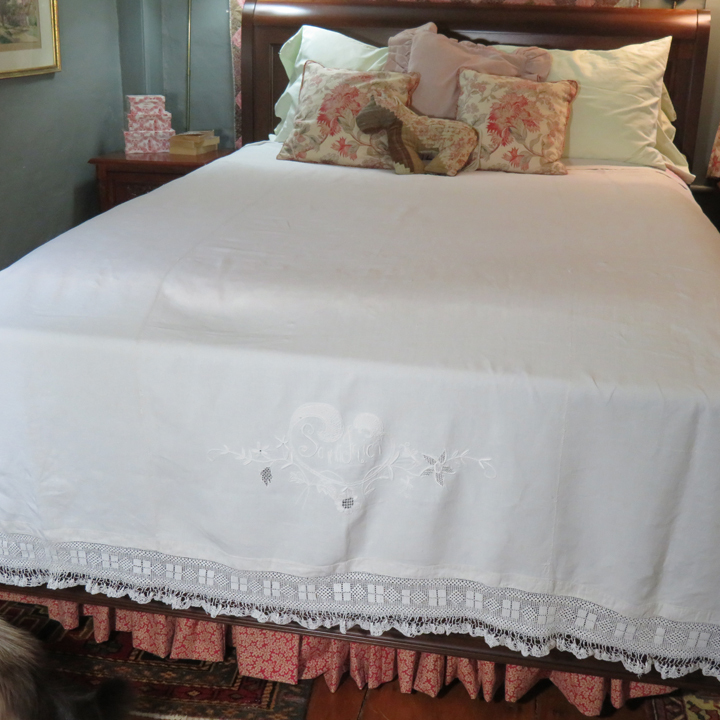 I feel that this coverlet is mid 19th century and was created in the northern part of New England, possibly Northern Vermont. The woolen thread is heavy and course adding extra warmth and durability. One side of this overshot coverlet is predominantly burgundy while the reverse side predominantly a natural linen color. I cannot imagine the months and months it must have taken to weave this piece. This coverlet appears to be unused. 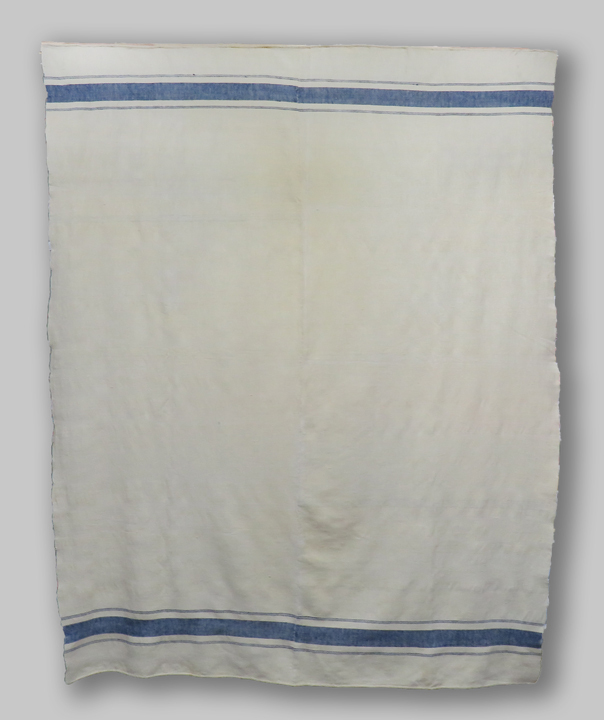 We have organically hand washed this amazing coverlet and it is now ready to be used in your home. 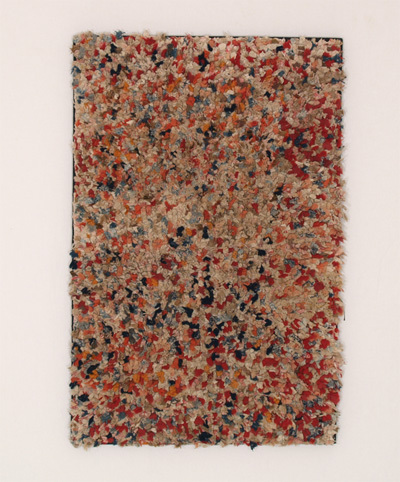 Believe it or not, this abstract folk art textile was created as a rug. Luckily, it has never been used. The rug is designed in two stacking methods. The first stacking is done in three squares measuring 4 1/4 inches, 3 1/4 inches and 2 inches. Each piece is outlined in a black buttonhole stitch. The second stacking combination is 3/1/4 inches with a 2 inch piece stacked on top and then outlined in a black buttonhole stitch. All fabric is 100% wool. There are two outside borders. One is a black 1 7/8 in border followed by a red 1 1/4 border. Someone in its history has already put sleeves on to get it ready for hanging. 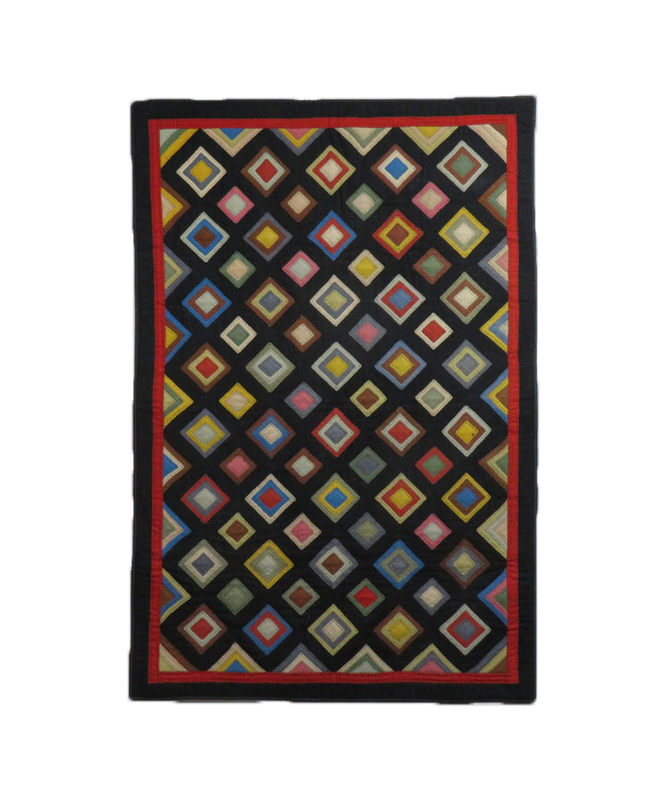 This gorgeous folk art geometric piece is outstanding as art for your wall. When hung, the piece looks 3-dimensional, and yes, you could put it on the floor as a rug, but I would want it on the wall. This quilt already has sleeves sewn on the back in case you would like to hang it as art on a wall. An Amish Father’s quilt is basically unheard of. The reason for the scarcity of these quilts is that they have rarely survived - especially from the 19th century. I purchased this quilt about 15 yrs ago from a private collection where it had been for over 20 years. The collector is a museum curator. I have in my possession a bible from this family that is being sold separately. 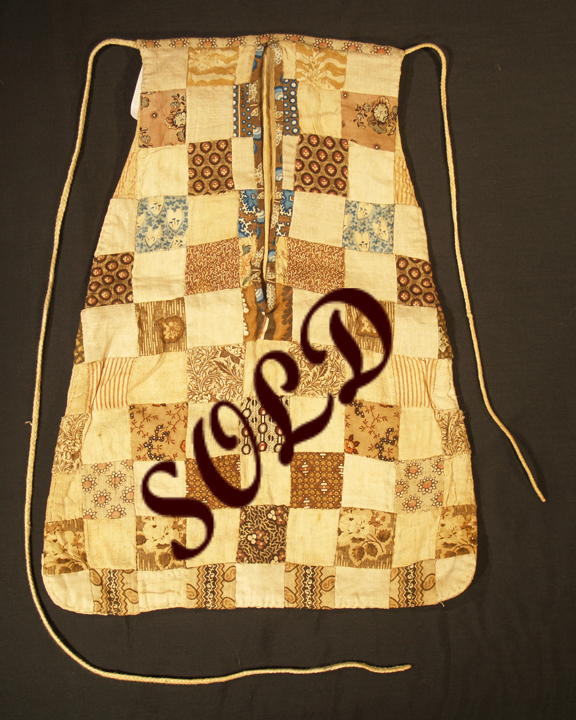 The provenance for this quilt will be given upon sale. I have decided after all these years that it’s time for this quilt to be a part of someone else’s collection. This piece is too important to hide. An Amish mother would create one quilt for her son to take with him when he married. This is for the son’s use only and is called The Father’s Quilt. The rarity of such a piece and the fact that they were used has led to the fact of basically being unheard of. Much of the fabric which makes up the quilt is home spun,. Most of the homespun fabric is woolen and dates from the Civil War or earlier. It is an unusual pattern and has a 4 block formation inside a apx 6” square with triangular corners. We also have dungaree fabric (not the 19th century term) and some heavy linen fabrics used in the construction of this rare quilt. Just about all of these fabrics are woolen homespun or home woven. There is both hand and machine stitching, a treadle machine would have been available after c.1850. I am dating this quilt apx c. 1880. This fathers quilt is in complete original condition. Yes, there is wear, but not of importance with this rare quilt. Serious collectors please email or call for a price. 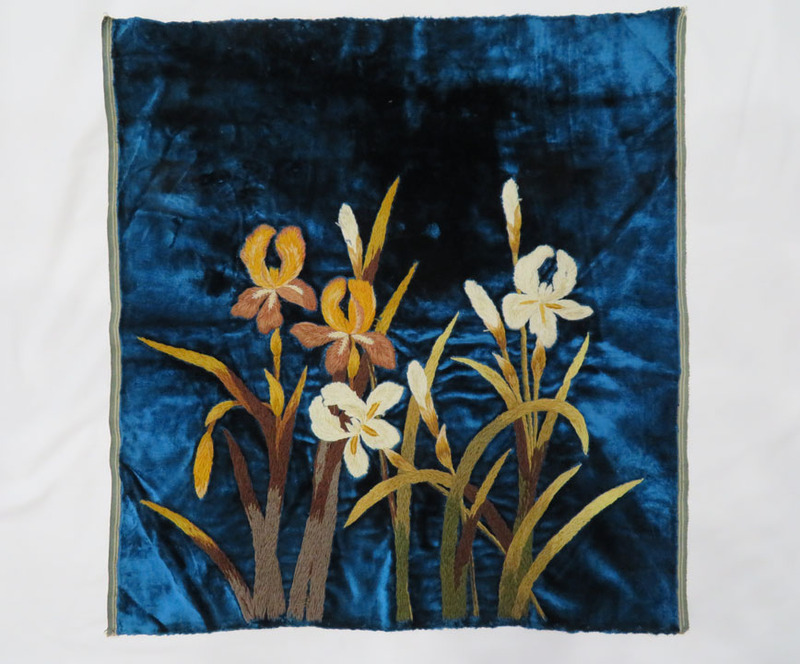 Irises of white and gold on a Prussian blue silk velvet. 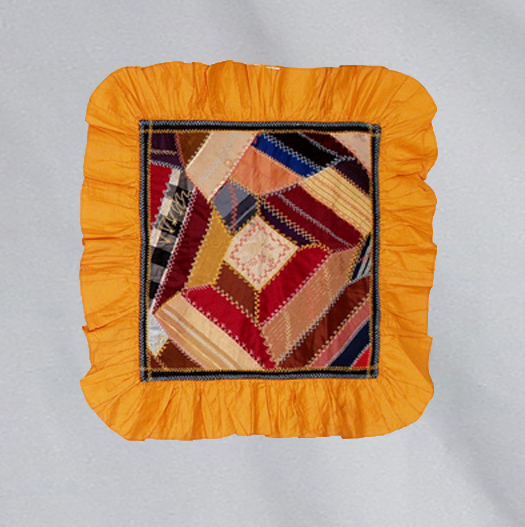 Was this originally made as a center medallion for a crazy quilt or was it made on it’s own merit? The embroidery is so lush it’s actually three dimensional. This piece is absolutely gorgeous. This would look perfect hung on the wall. We can sew sleeves to the back for borderless framing. The sophisticated art of needlepoint has been executed for hundreds of years. The women who participated in this art form had to have had an unbelievable amount of patience. I can’t imagine how long each seat cushion took to make.... certainly months. We have birds, flowers, vines, leaves and more all perfectly executed. 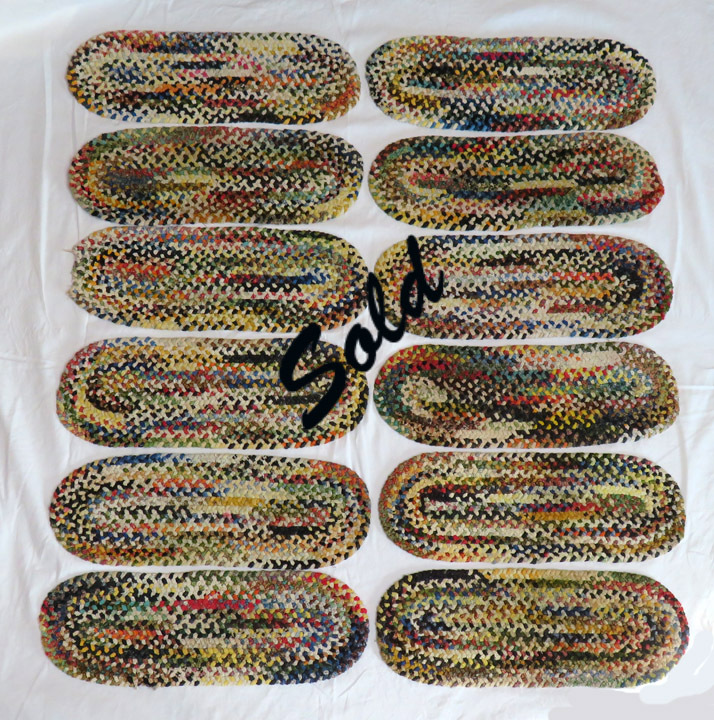 There are 6 needlepoint cushions, 5 in perfect condition and 1 with an area with color missing. 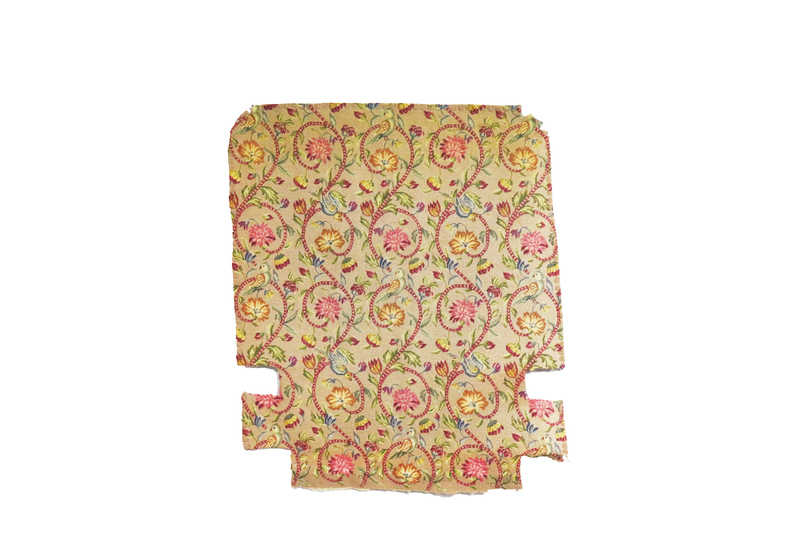 Today they could again be used as seat cushions or backs and seats for small chairs or as the most sophisticated and exquisite pillows. The sizes are apx 24-1/2 x 28-1/2" plus 1/4” edge turned under, 18" x 29” could be easily cut or 19 x 24” completely clear. If interested please call ....these can be sent on approval. During the 18th century in England and America many women embellished their bed hangings and bed spreads with woolen crewel embroidery. This amazing woolen piece is embellished with exact replicas of that work. It is signed and dated. This crewel embroidered piece was created with a center medallion format and encompasses much symbolism from the 18th century. Originally made as a pillow cover however never used I have now closed the open seam ( used to insert a pillow ) and sewn two sleeves on for hanging purpose. Enjoyed it in my home for two years, now ready for a new home. Dated 1900 and signed C.S. Stadler. This originated in Pennsylvania, possibly in the Lancaster County area. An amazing piece of art for your wall in original condition, ready to be sent on approval. The stars are free hand placed on the indigo blue background. When one looks at the stars they appear to be dancing and whimsical. The stars are linen and the indigo blue and red and white stripes are wool. Yes, there are moth holes. I always tell people to be careful when buying a wool piece without moth holes. The moth holes are a sign of authenticity. A wool antique without moth holes would be suspicious. The indigo background measures 41" x 33”, the stripes are 4-1/4“ wide and the stars measure 3” tip to tip. This flag is too large to photograph. 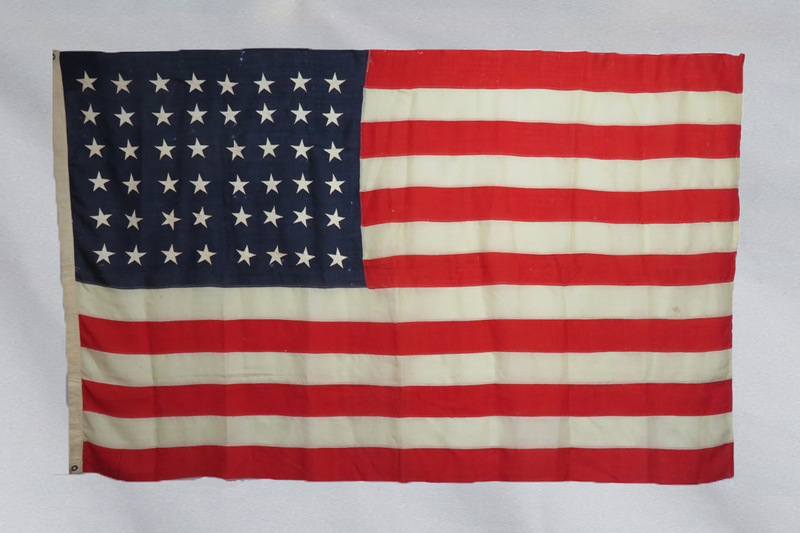 I believe this one is a WWII vintage flag. The stripes are 7-1/4“ wide and the stars measure 4-3/8” tip to tip. Thousands and thousands of Victorian glass beads hand strung to create embellishments. 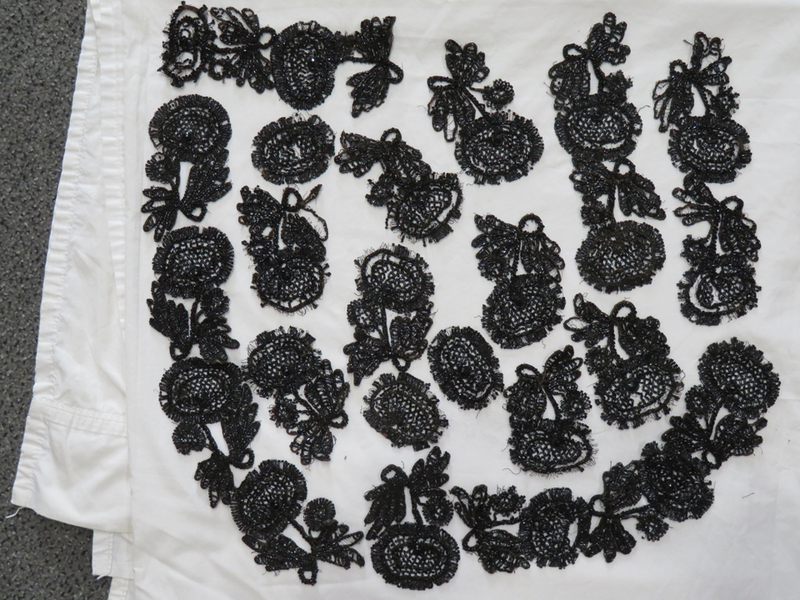 These were removed from an 1880’s Victorian evening gown. There are some embellished pieces that are ready to be applied to whatever you wish. They can be applied to clothing, pins and hats. There are at least two pounds of Victorian glass beads in total. This piece is comprised of hundreds of hand folded squares, folded in such a way as to create points. Pieced in a circular motion which emulates the feel of a pinwheel. All by hand. Perfect condition. Would be nice framed or used as a table mat or to become part of a quilt. Hand quilted, hand embroidered and all ready to be filled with a little pillow. Original unused condition and professionally hand washed by Betsey. Is this Winnie-the-Pooh holding on to a branch attempting to get some fruit from the tree? Unused condition, organically hand washed by Betsey. Absolutely adorable. Hand appliquéd, hand embroidered and hand quilted. Machine applied binding and ties. A 15 year anniversary present with dozens of hand embroidered signatures. One of a kind. Funky folk art. During the Victorian era when we would have finished embellishing, it appears that they just started. 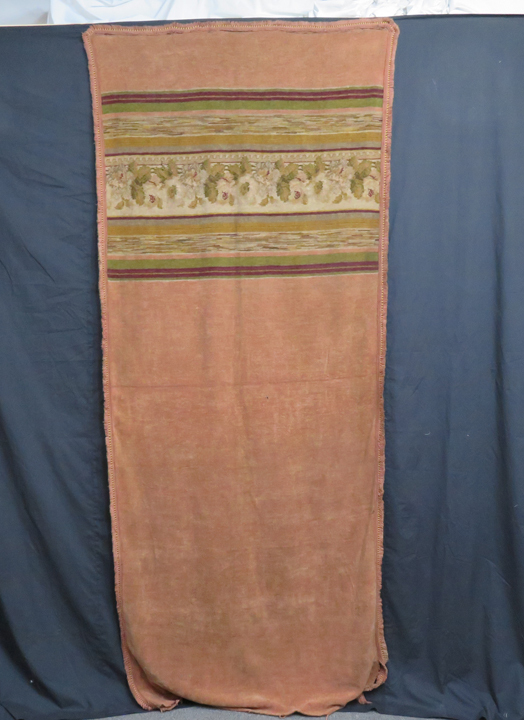 This cotton chenille drapery panel, is c.1890. The embellishment along the top, bottom and sides is all raised chenille. It’s just beautiful. The photograph does not do it justice. Some of the tassels are not in perfect condition, and there is some wear on this piece. However, the fabric is amazing and could be used to make pillows, to upholster a chair, or as a throw on a couch. I do not know what this was originally used for. Possibly yardage for drapery fabric. Today it can be used as a tablecloth, pillows, drapery fabric or anything you wish. Because the word war is stamped on the side, is it possible that this was meant to be used during WWII? In barely used condition, with black eagle and lettering and blue and brown stripes. There are some very faint stains. Cotton balls were picked by hand and put into this sack. A strap was fastened on the sack and around the picker’s shoulders. 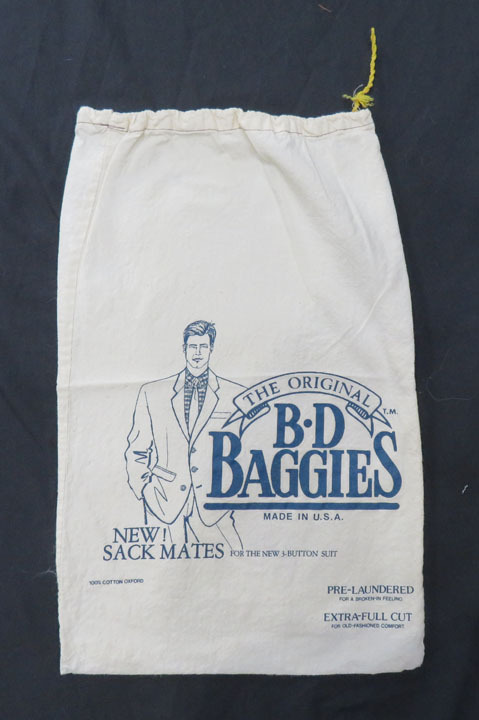 This sack has never been used. If the seam was undone and the sack opened it would measure the full width of a homespun piece which would be 36” selvedge to selvedge. I was told these came from a gambling hall in Colorado in the 19th century. 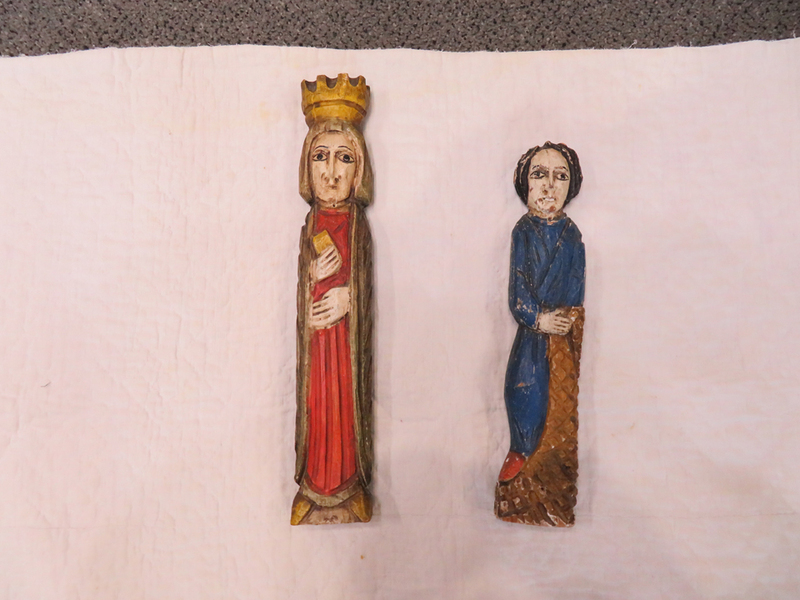 Hand carved, hand painted and believed to be mostly original paint. The crochet is 9 inches long from the shoulder front and back. The sleeves have 1 inch of crocheted trim. This bag is 22 inches selvedge to selvedge on a piece of fabric that runs 34 inches long. Natural homespun linen was a New England fabric. It would take two years to make this, starting with planting the seed needed to make the flax for the linen. There are many gauges of linen thread. The finer gauge would be used for sheets and table cloths. The heavier gauges were used for bags, such as this one, or weaving with wool to make a Linsey Woolsey quilt. During the 19th century women wore shawls not only for fashion but for warmth. These were our 19th century coats. Women would wrap the shawl around and around and drape it nicely. 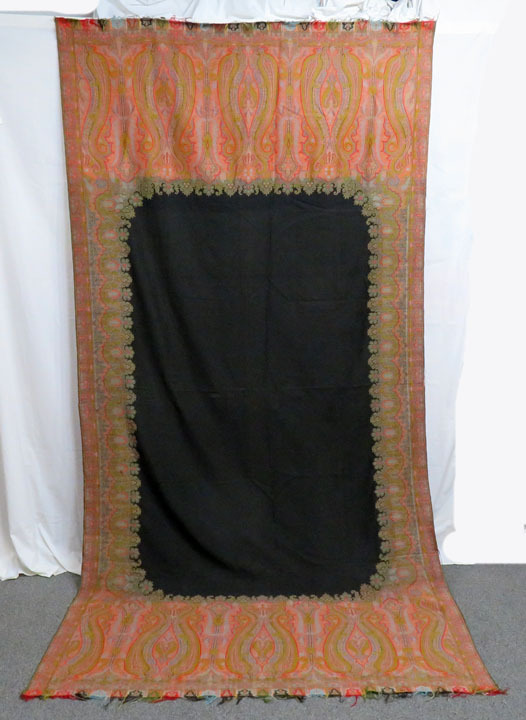 The black center of this paisley shawl is a beautiful 19th century black wool challis, which does not photograph well. (It’s a much richer black than shown in the photo). When you are not using this shawl as a drape on the way to the theater, it could be used as a banquet tablecloth in your dining room. This exquisite piece of art was meant never to be seen but to be worn under our dresses to keep us warm in our own homes where the only heat was from fireplaces. Exquisitely quilted by hand with the same quilting designs that would have been used on a full size bed quilt. The 1-1/2 inch edging is knit with a 0 needle. We have wreath quilting, cross hatching, some of the most beautiful and minuscule quilting stitches I have ever seen. 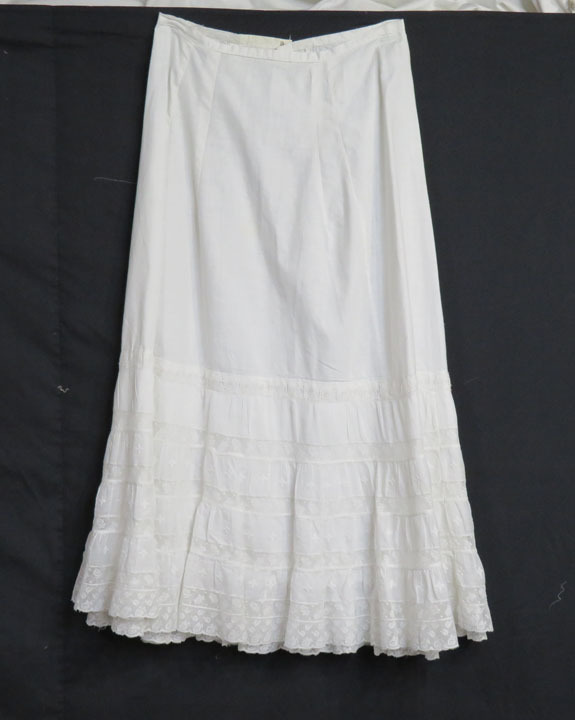 Today this white quilted underskirt could be worn as a skirt. The waist band at the moment is 29 inches but there is plenty of room in the pleats to expand. The length is 37-1/2 inches. I believe his piece was made pre-1835, but I cannot prove it. From the looks of this petticoat it was hardly used. All original condition. During the 19th century women wore shawls not only for fashion but for warmth. These were our 19th century coats. Women would wrap the shawl around and around and drape it nicely. This is exceptionally long, measuring 137 inches. 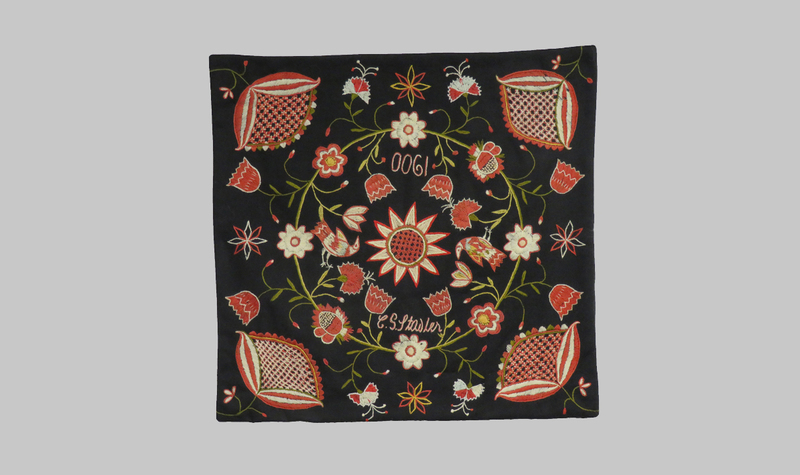 Because of the large size of this shawl, it could also be used as a banquet size tablecloth. Muted moss green, beige and red, the overall look is sophisticated. Fabulous condition. These soft cotton stair treads feel to me like a tightly woven chenille. In complete original condition, these stair treads appear to have been barely used. Can you image the days and months it would have taken to create these? Maybe they were too precious to use but they are perfect for someone to enjoy today in their home. There is one stair tread that has a small semi-circular piece missing from one edge. I have left it as is because to me it is telling some unknown story. If you would like it restored, I am happy to do so. Professionally washed by Betsey and ready to use. Set of 12. 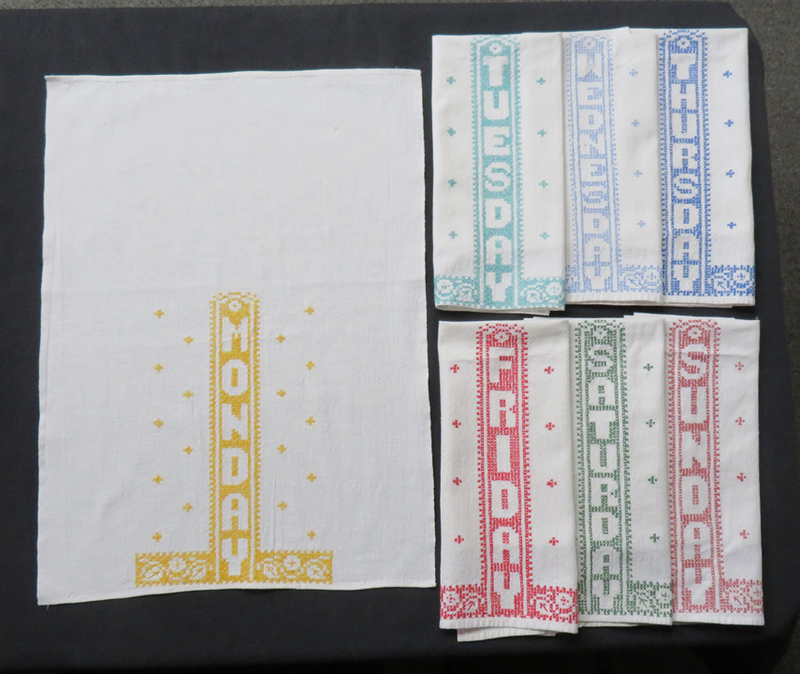 A complete hand cross-stitched set of 7 dish towels. A different color for each day of the week. 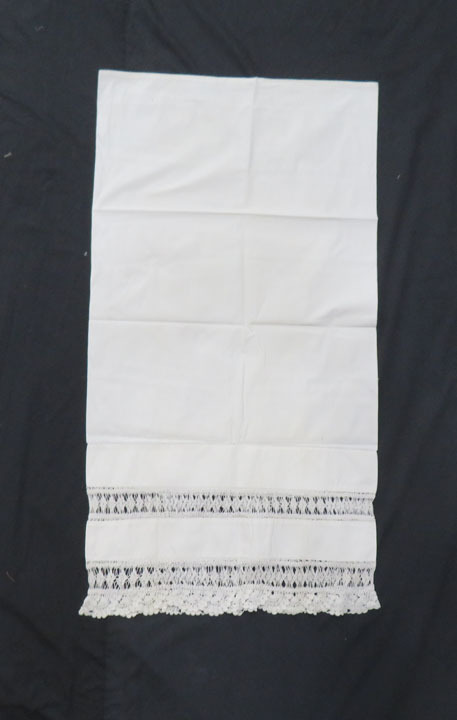 Created on heavy white feed sack fabric. The width measures selvage to selvage (finished side to side). These appear to be barely used. They are professionally washed and ironed. There are still a few very muted original stains. Sold as a set of 7. The crochet embellishment is beyond gorgeous. In perfect condition. For whatever reason, this has never been used. 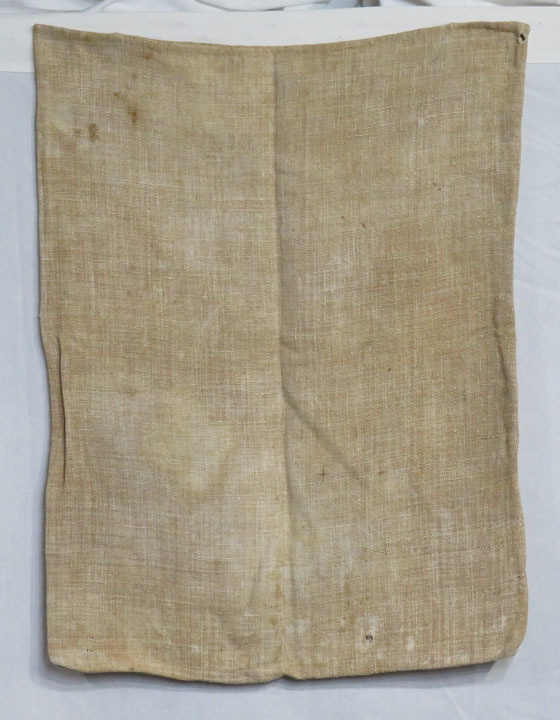 This 100% cotton feed sack was used as packaging for an extra pair of suit pants. The quilt came from an 1820 house, but the quilt pre-dates the house. This quilt talks to me. Have you ever seen a quilt that is comprised of numerous other quilts sewn together in order to make a very graphic quilt to keep you warm? 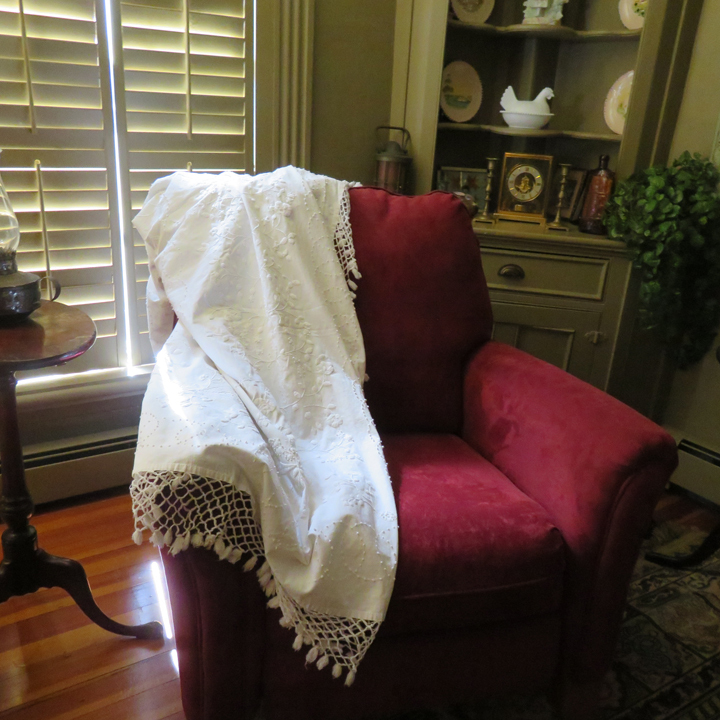 The fabric used in this quilt is early New England homespun. I feel that most of this fabric is from the 18th century. Before the Revolutionary War England would not allow us to raise Moreno sheep, which produce soft wool. We could only have sheep for mutton, which produce coarse wool. The majority of the homespun on this quilt is made from such sheep that produced coarse wool. Back in the 18th century and early 19th century in New England we were concerned with staying warm. Such fabrics would achieve this purpose. 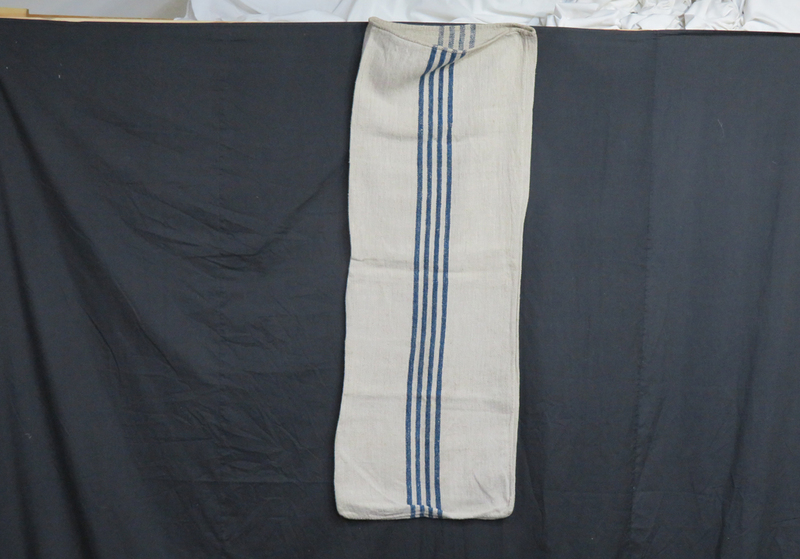 One of the strips has blue woolen fabric that appears to be of a finer quality. I am not sure if this was purchased from England or if it was spun by the family. We also took a picture of the back to show you where strips of another quilt were added to make this larger. Creating such fabric often took as much as 2 years from start to finish. 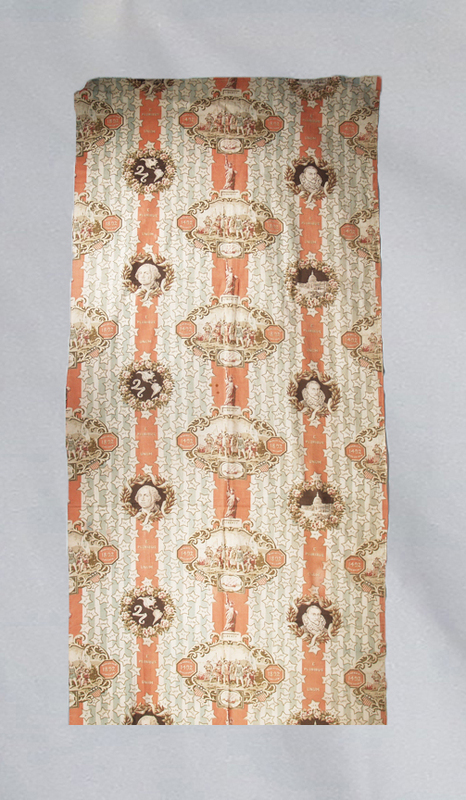 This fabric would have been loomed at home, usually on the third floor of old New England colonials. After the fabric was woven the last process before creating a textile was to dye the fabric different colors. All the colors were from vegetable dyes. There were approximately seven different vegetable dye colors available to New Englanders. 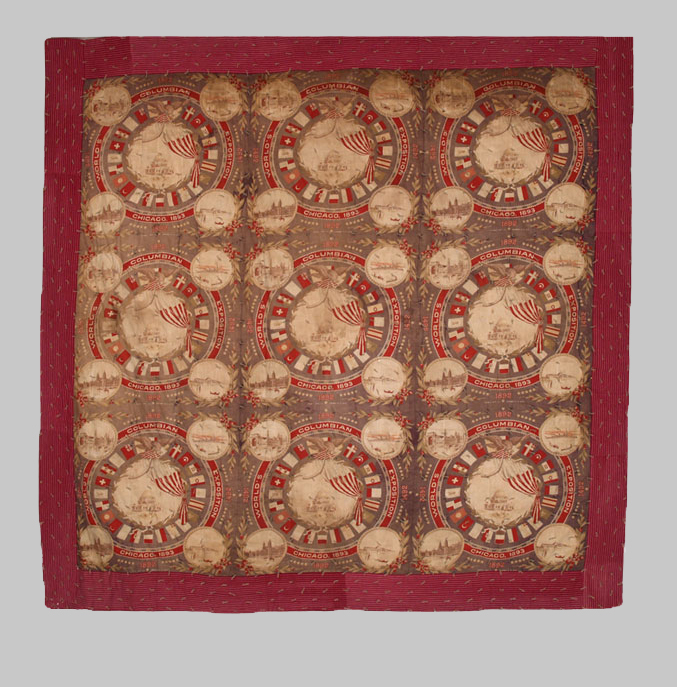 This quilt was made in Fall River, MA by a Quaker family. 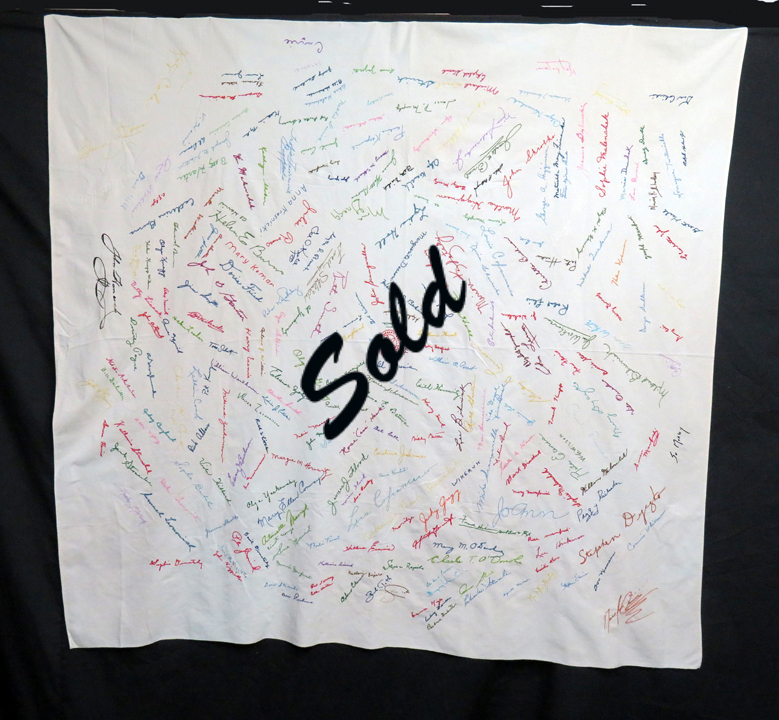 The name is available on the sale of the quilt. The house it came from was built in 1820. I wonder if their previous home burned, which was not unusual in those days, and they salvaged what they could from the quilts that survived, putting them together to create a fabulous early textile. History absolutely jumps out of this quilt. The red and black star, the only pieced part of the quilt, would have been the newest addition. This also goes along with the fact that it is in the row with blue fabric that is from a newer wool fabric. 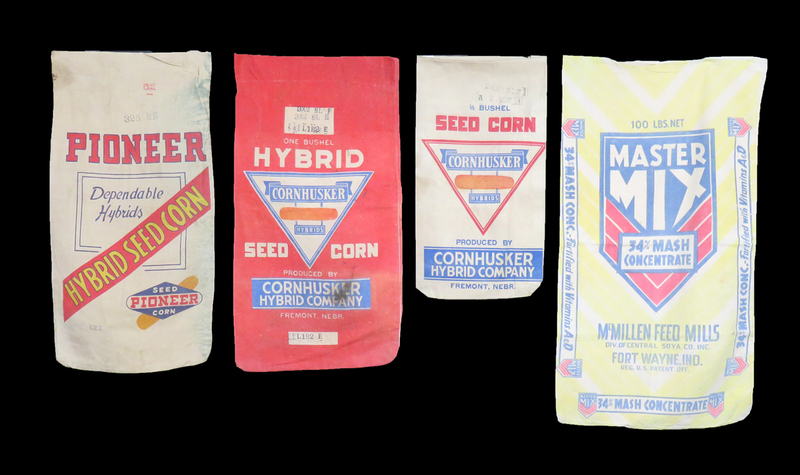 The diamonds on point in this row are also from early homespun linsey. This is a quilt I could study and study and never get tired of looking at it. 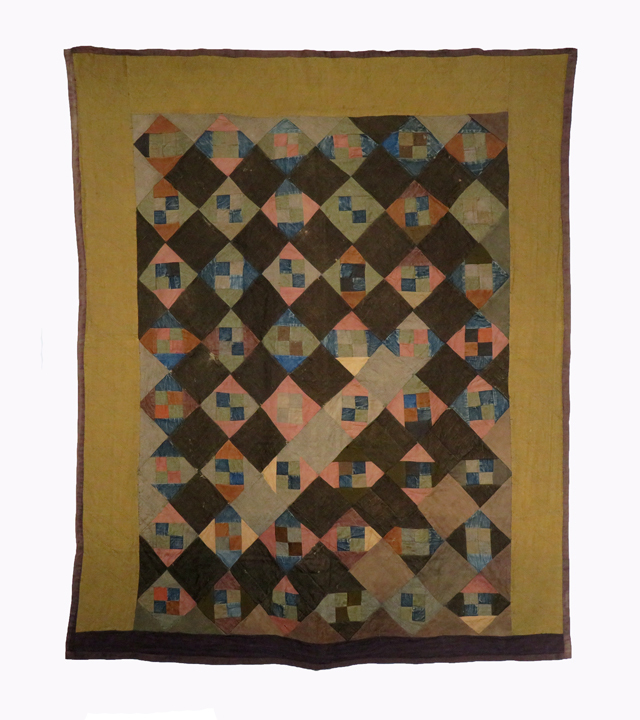 The fabric used in this quilt is wool and/or a combination of wool and linen, sewn and quilted with linen thread. You will find moth holes on the early piece, and my advice to anyone thinking of buying an early wool quilt is that if it has no moth holes, then it is probably not an early piece. We are not surprised that this is hand sewn since it was created 20 years before the sewing machine. The backing, binding and border surrounding the edge are Prussian blue. In the late 20th century, one would call it cobalt blue. Quilting was a woman’s mark of excellence and this piece surpasses all expectations. The quilt has applied sleeves sewn on by Rocky Mountain Quilts and is ready to hang. Call Betsey for more details. Was made for a pillow but has never been used. The bottom 9 inches are comprised of 3 1/2 inches of exquisite crochet work and 2 inches of percale. 30 inch waist. Appears to be executed with a 0 size needle. 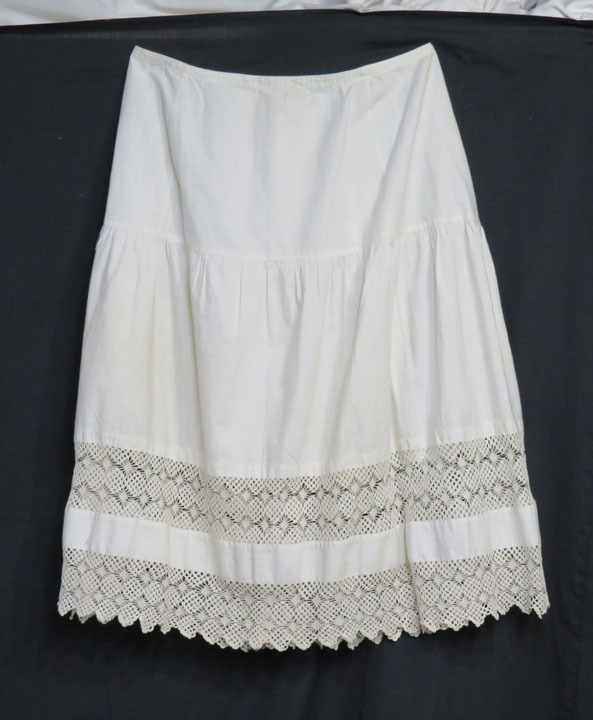 The bottom 15 inches of this “skirt" has wonderful layers of lace and trim. 30 inch waist. 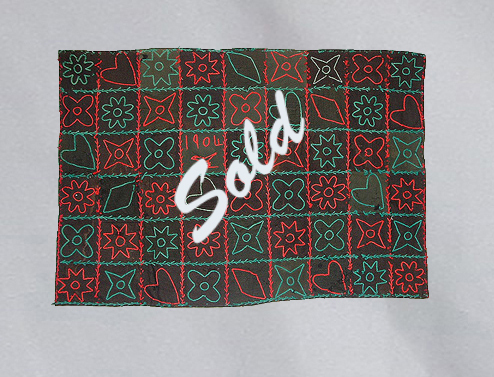 This Amish table runner is embroidered in hearts, diamonds and stylized flowers. In a wonderful size for the wall or for a table when it is not being used. Some wear. 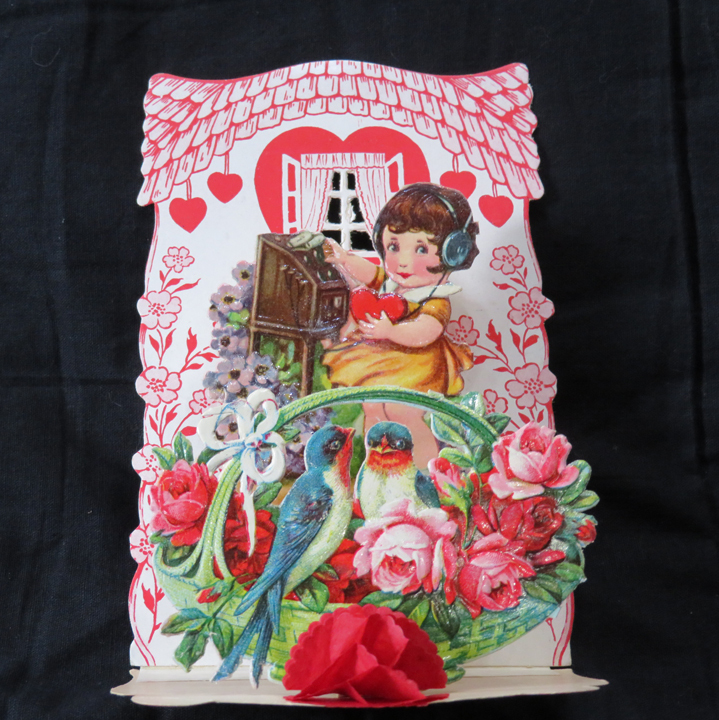 Yes, we know this piece only dates back to the early 1960’s, which is new in Betsey’s world, but isn’t it wonderful? 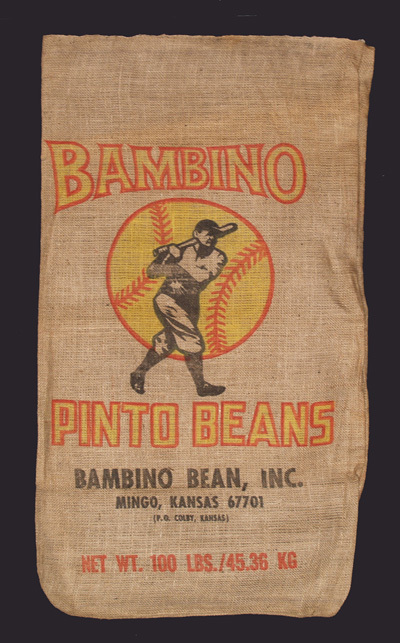 The Bambino Bean company used these 100 pound burlap bags to package pinto beans until Babe Ruth’s estate stopped the use of the Babe’s image. 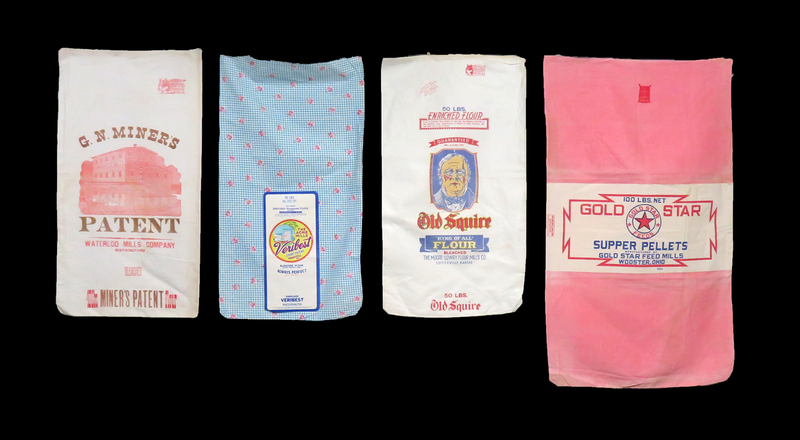 Betsey bought these five bags on one of her trips across the country over 10 years ago, and then forgot about them until she was up above the barn rummaging for treasures. So, whether you are a Red Sox fan, a Yankee fan, or just a fan of the game…one or more of these pieces would be perfect to add to your collection, and would look great on the wall as you cheer on your teams! 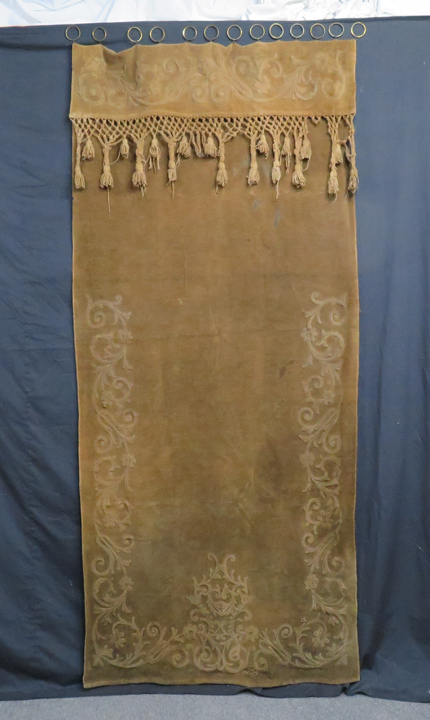 A beautiful and rare piece of Amish textile art that would be a perfect wall hanging or folk art center piece for a table. 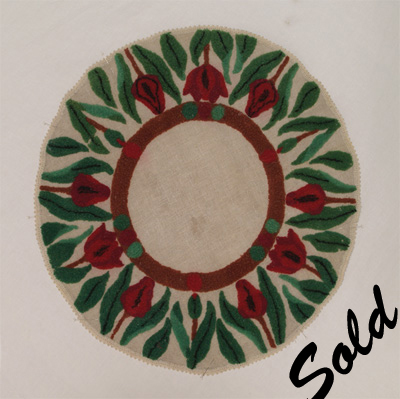 Wool stumpwork tulips are arranged in a wreath-like formation in perfect Christmas colors on ecru homespun linen. A delicate ¼” crocheted cotton lace edge frames the whole and is a lovely finishing touch. It appears to be hardly used with one slightly shaded area in the center which can be seen in the photograph. Colorful, dimensional and funky this is a fabulous piece of folk art for your home. Betsey found this fantastic piece in New Hampshire. It showcases an exuberant confetti-like arrangement of wool and cotton fabrics. This beautiful textural and very graphic piece is perfect for that special place on your wall. 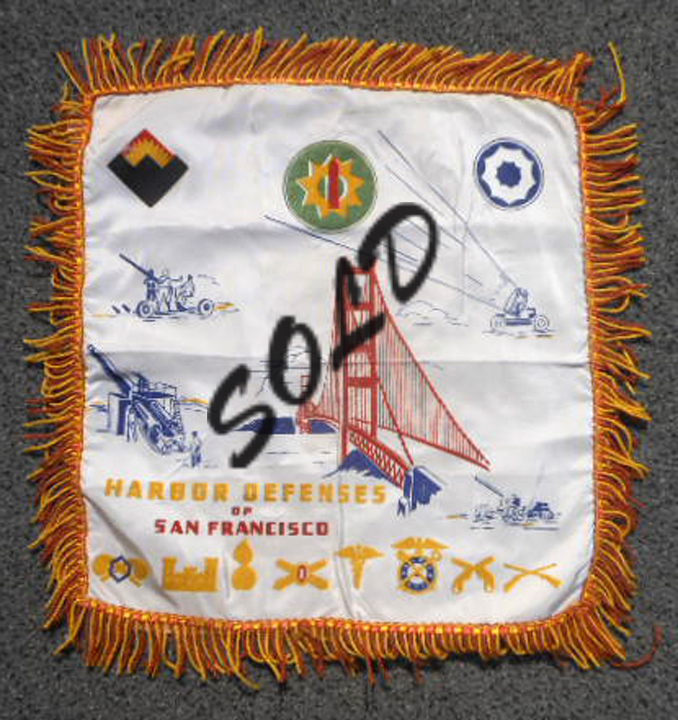 It was purchased already mounted and ready to hang as a very unique piece of textile art. Embellished with embroidered cross stitching. The edges are finished with a blue button hole stitch. There is a running chain stitch all around the tablecloth 3 inches from the edge creating a border. 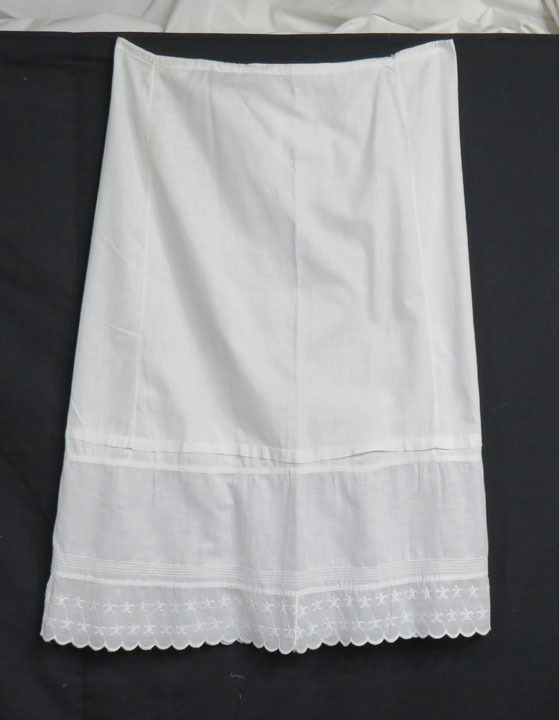 Can be worn as a summer skirt. Draw string waist. Max width 38 inches. In perfect and original condition, this pillow sham contains a fantastic collection of silks and silk ribbons. Every seam has been skillfully embellished with a variety of soft colors in Pearl cotton, using feather, fly, double herringbone, buttonhole, and outline stitches. The center block has been further embellished with a nosegay of rose flowers with yellow-green stems and leaves. The backing and ruffle were made from a high thread count orange polished cotton. 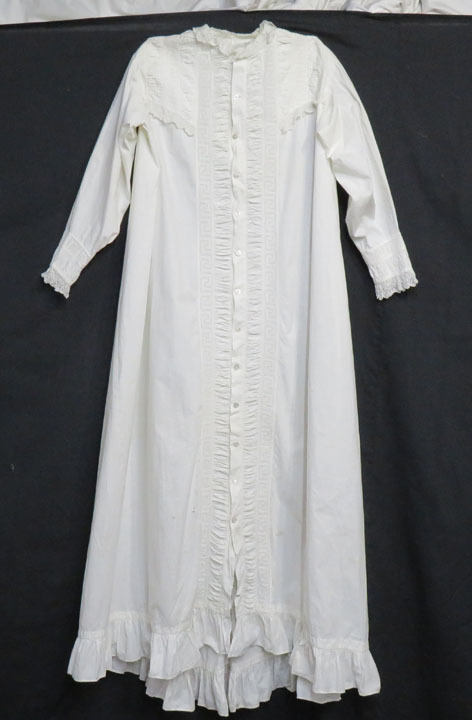 Please note that for photographic purposes only, this sham was fastened to a white background sheet using long pins, which are visible in the photograph along the top ruffle. Name of maker upon sale. This wonderful wool penny rug consists of 3 ¼ inch diameter circles of felted wool each with hand appliqued felted wool flowers accented with fine wool hand embroidery. The 4 inch long scallops, or tongues, along the entire edge also contain felted wool appliques, embroidery and a crocheted edging. Professionally mounted on a wood frame covered in black cotton and ready for hanging. We show it vertically here, however it hangs as a horizontal work of art in Betsey's large kitchen. 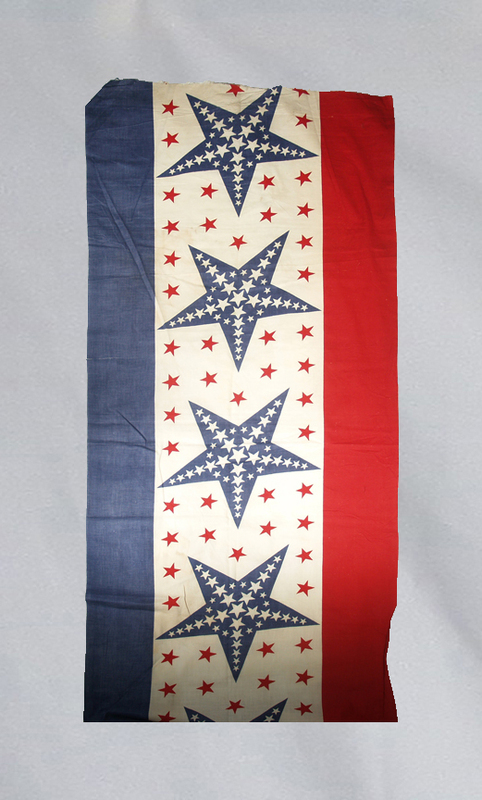 This stars and stripes bunting is from either WWI or WWII, I am not sure which. I found this piece in Maine. Prior to the advent of paper decorations, we would use bunting to decorate for elections, presidential birthdays, and other political celebrations. This yardage of fabric was printed for the 1892 Chicago World's Fair. It can be purchased for a complete repeat print. Celebrating Columbus and the discovery of America in 1492, there are Spanish explorers and Indians depicted on the print. The stars represent the states in the union as of 1892. 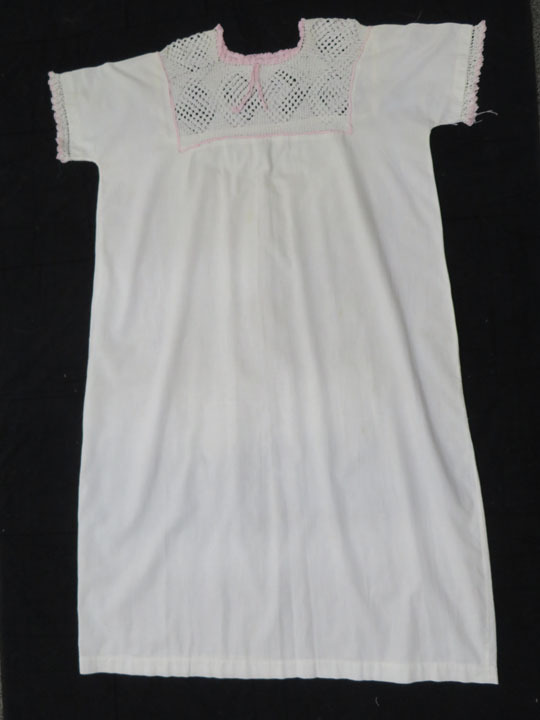 At one time women would wear such a pocket under their dresses or skirts to put the items in that they wished to carry with them. 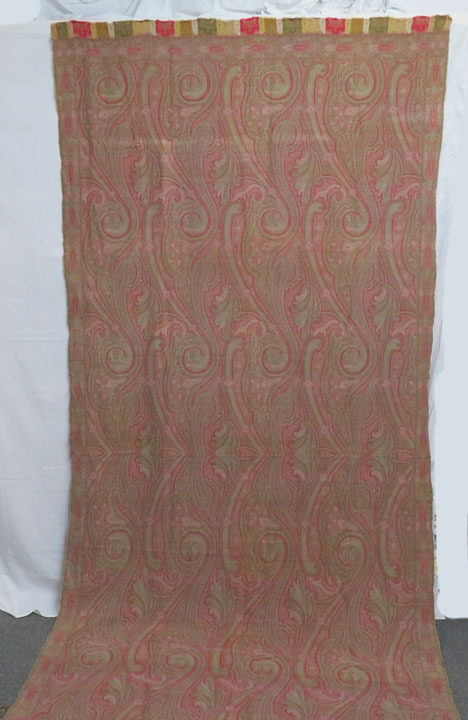 Created from linen and block print linen calicoes, this is indeed a rare and unusual treasure. Many years ago there was some restoration done to this piece. The back is a solid ecru linen. 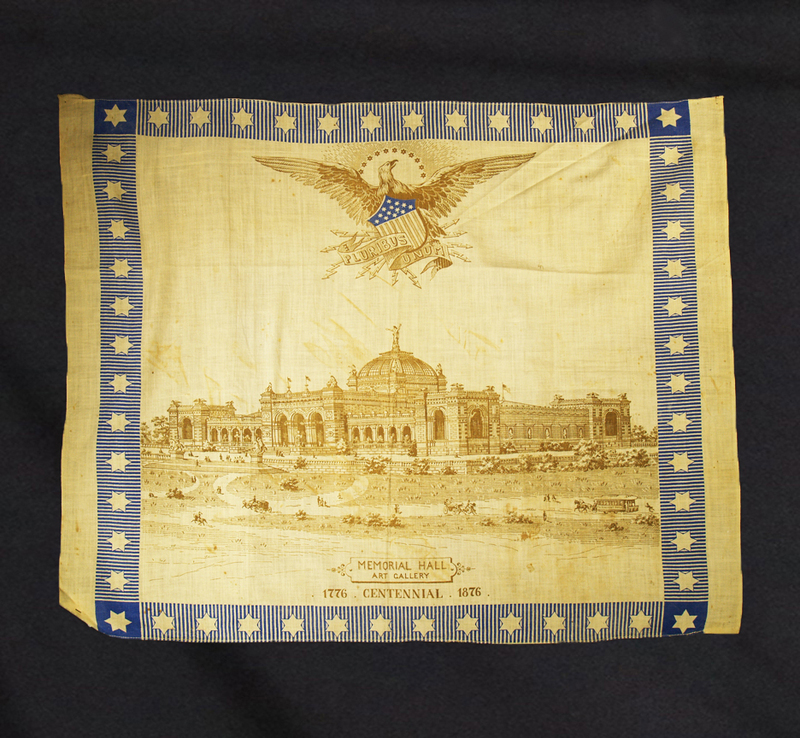 Completely original scarf from the 1876 Philadelphia Centennial Fair. Complete original condition, this rare piece is truly a collector's item. 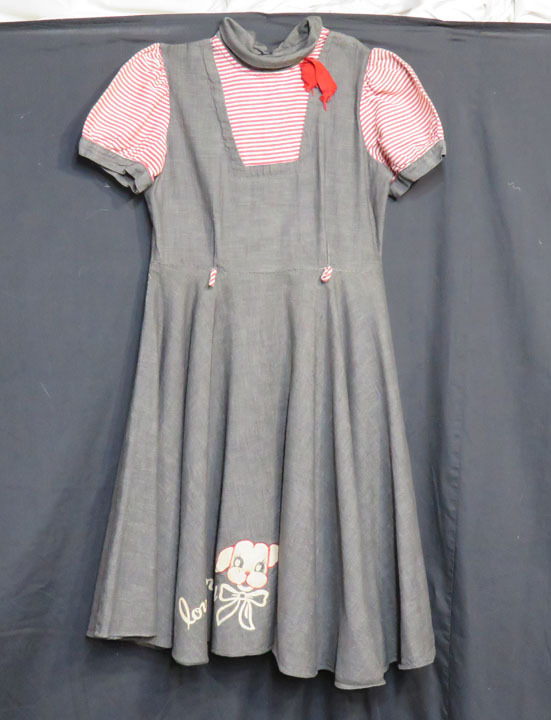 Child’s 1950s Cotton Poodle Skirt embellished with “Love me…” Buttons in the back. Appears to be sized for a ten year old. Calimanco (also spelled calamanco) is a sturdy glazed Lindsey-woolsey fabric which was popular in Britain and America during the mid to late 18th and early 19th Centuries. 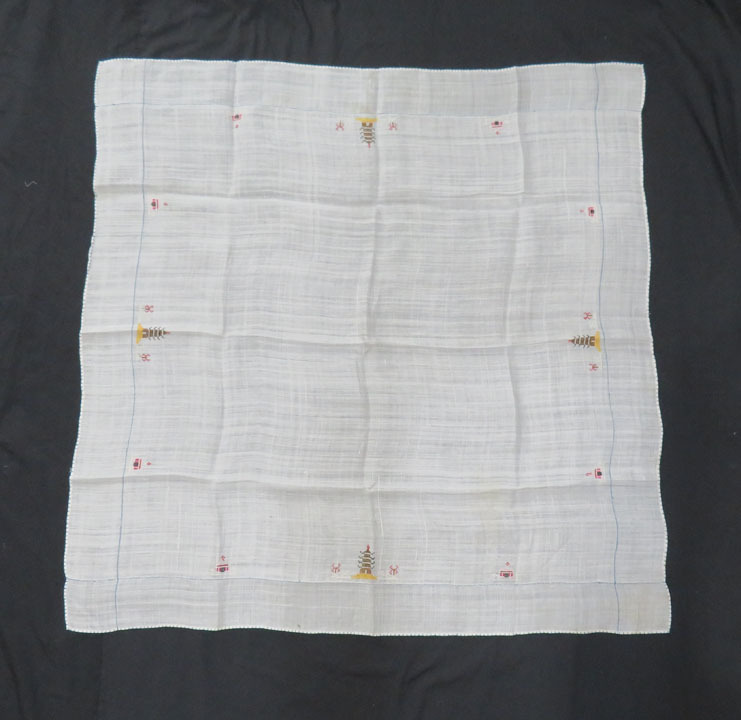 For quilt collectors and textile enthusiasts, the primary characteristics of a calimanco are its glaze, which was produced by rubbing the cloth with a stone or by applying egg white or wax to the surface, and its woolen homespun fabric. 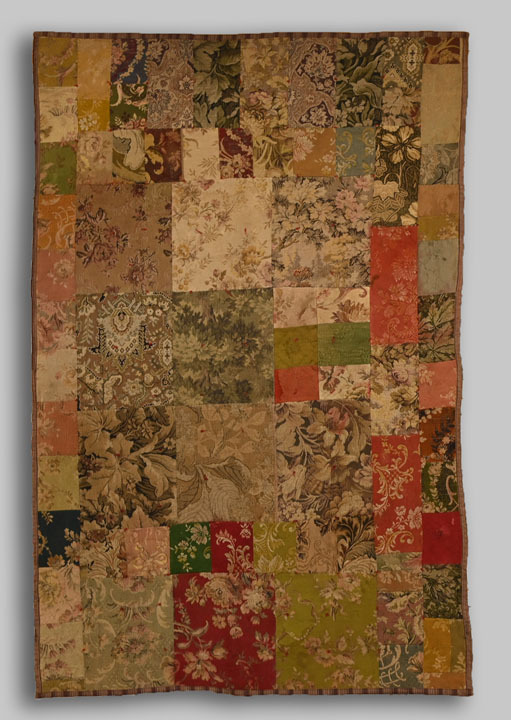 This is a lovely sample from a strip pieced Calimanco quilt from the 18th century. Perfect for use as a study piece it retains beautiful glaze on the front and the back is linsey woolsey in two pieces; one Indigo dyed and the other walnut. See detail images. A wonderful 12 x 12 inch sample from a walnut dyed 18th century Linsey Woolsey quilt. Perfect for use as a study piece it is a beautiful rich walnut brown with a homespun wool back. One side is pillowcase edged to the homespun back with a double line of hand top-stitched lines. Note the weave repair near the edge using wool thread that we assume was done a very long time ago as that is the traditional way a wool quilt would have been mended. See detail images. 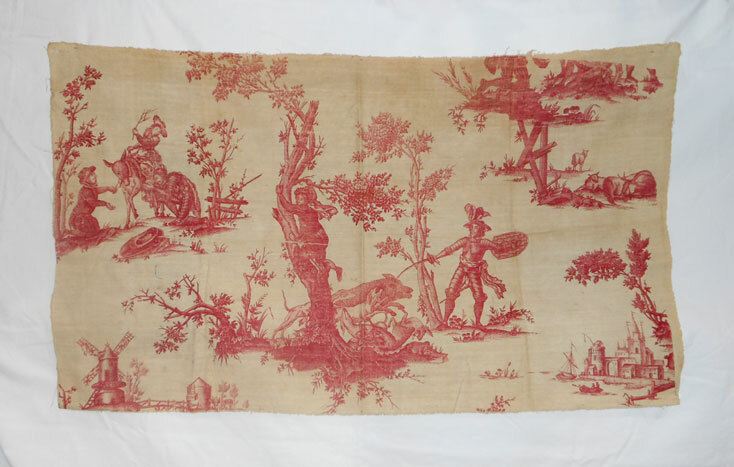 Such a lovely early French toile fabric piece in red on natural linen. We believe it's almost a full repeat of the pattern, the right and top right edges show the end of the print block. Beautiful detail in the printing, please see detail images. A nice size to use as a decorative piece or a wonderful study piece for early fabric connoisseurs. 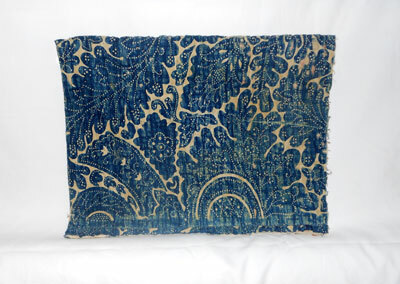 A gorgeous early indigo blue dyed block print on this quilt piece. On the back a fabulous print in blue, red, yellow, black, and green. Wonderful for study, Betsey has kept a piece to use in her lectures on early fabrics. See detail images. The backing on this piece is disconcerting as in reality it is the front of another quilt. 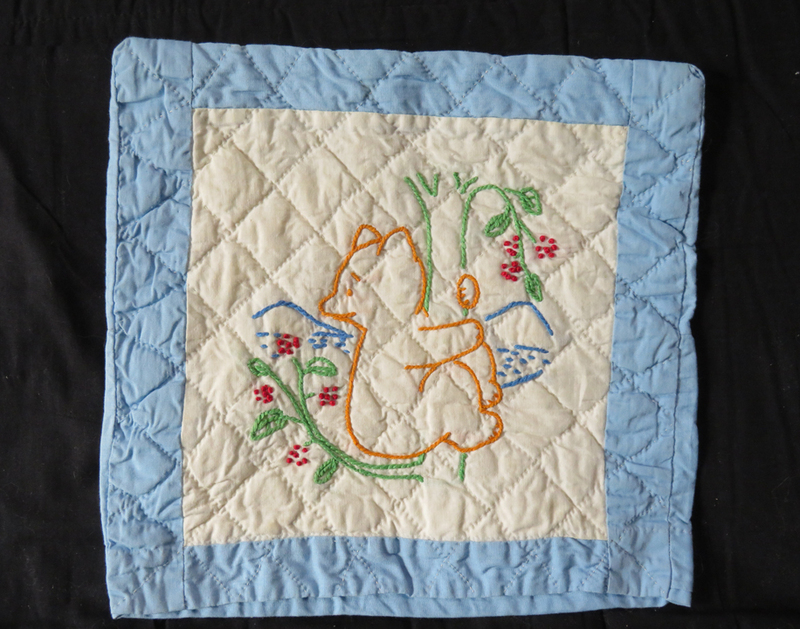 At one time someone quilted two different quilts together -- both backed with homespun linen. I assume this was for warmth. A few years ago Country Home Magazine did a wonderful story on Betsey, her antique quilts for sale, and her restoration business. Their designers fell in love with the antique Redwork Signature blocks we had in the shop and made a few fabulous pillows for us using some of their favorites. The Redwork blocks are circa 1885 and are paired with contemporary linen, ribbons and/or buttons. They each have a down feather insert and invisible zipper. Gorgeous and very comfy they are priced individually. 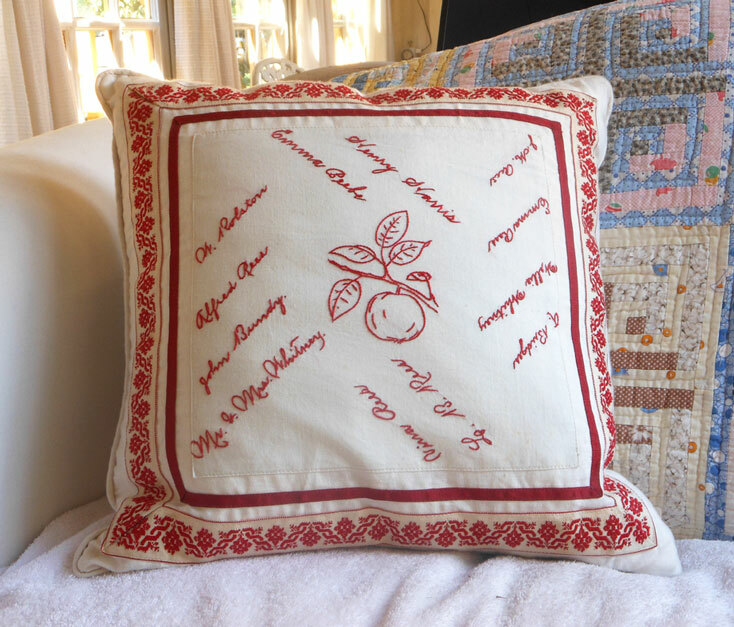 This pillow features an apple on a branch in the center of the signatures - please see the detail pictures. A lovely mix of antique and contemporary - each pillow is unique. Cigars were the most popular tobacco product used in the 19th Century, with most households having at least one cigar smoker. A cigar box would contain several bundles of six to eight cigars, each bundle wrapped in a silk ribbon sporting a printed brand name or number. These ribbons served not only the practical purpose of packaging the cigars but also as a way to attract buyers to a specific brand. Women were encouraged through literature distributed by the tobacco companies to use them to make things for the home such as pillows, table covers, purses and even curtains for windows and doors. This lovely example of a cigar silks quilt highlights its sheer elegance by the use of only certain silks and by the artistry and skill that were used to create it. The fact that it is so large and obviously created for use on a bed is extraordinary as they were mostly made for smaller decorative purposes. The quilt is surrounded on three sides by a 7 inch wide gold cotton ruffle. Reverse tied with an ecru backing pillowcase edged to the top. A gorgeous piece of work beautifully designed by its maker. This quilt can be shipped to you on approval for private viewing. A few years ago Country Home Magazine did a wonderful story on Betsey, her antique quilts for sale, and her restoration business. Their designers fell in love with the antique Redwork Signature blocks we had in the shop and made a few fabulous pillows for us using some of their favorites. The Redwork blocks are circa 1885 and are paired with contemporary linen, ribbons and/or buttons. They each have a down feather insert and invisible zipper. Gorgeous and very comfy they are priced individually. This pillow features an owl and four different buttons at the corners - please see the detail pictures. A lovely mix of antique and contemporary - each pillow is unique. A few years ago Country Home Magazine did a wonderful story on Betsey, her antique quilts for sale, and her restoration business. Their designers fell in love with the antique Redwork Signature blocks we had in the shop and made a few fabulous pillows for us using some of their favorites. The Redwork blocks are circa 1885 and are paired with contemporary linen, ribbons and/or buttons. They each have a down feather insert and invisible zipper. Gorgeous and very comfy they are priced individually. This pillow has a patriotic color palette with hand made ribbon flower buttons with jewel centers - please see the detail pictures. A lovely mix of antique and contemporary - each pillow is unique. A few years ago Country Home Magazine did a wonderful story on Betsey, her antique quilts for sale, and her restoration business. Their designers fell in love with the antique Redwork Signature blocks we had in the shop and made a few fabulous pillows for us using some of their favorites. The Redwork blocks are circa 1885 and are paired with contemporary linen, ribbons and/or buttons. They each have a down feather insert and invisible zipper. Gorgeous and very comfy they are priced individually. 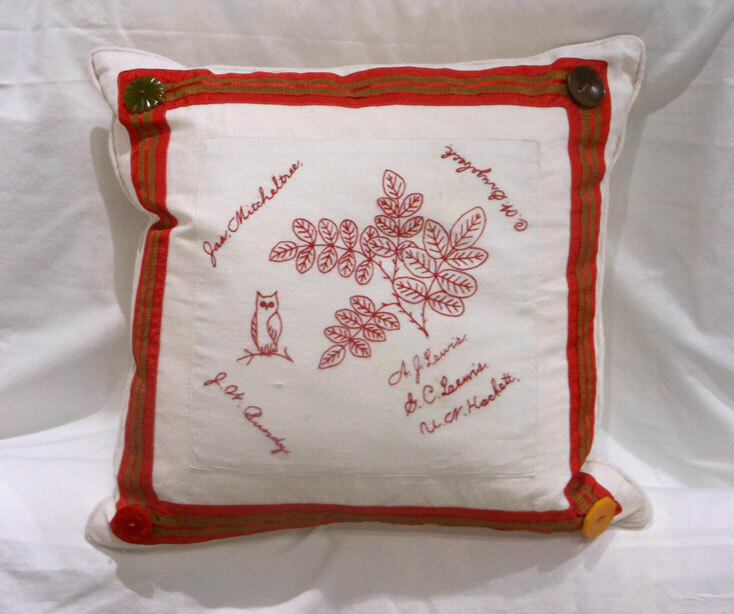 This pillow has sweet Redwork flowers and leaves amid the signatures - please see the detail pictures. A lovely mix of antique and contemporary - each pillow is unique. A few years ago Country Home Magazine did a wonderful story on Betsey, her antique quilts for sale, and her restoration business. Their designers fell in love with the antique Redwork Signature blocks we had in the shop and made a few fabulous pillows for us using some of their favorites. The Redwork blocks are circa 1885 and are paired with contemporary linen, ribbons and/or buttons. They each have a down feather insert and invisible zipper. Gorgeous and very comfy they are priced individually. 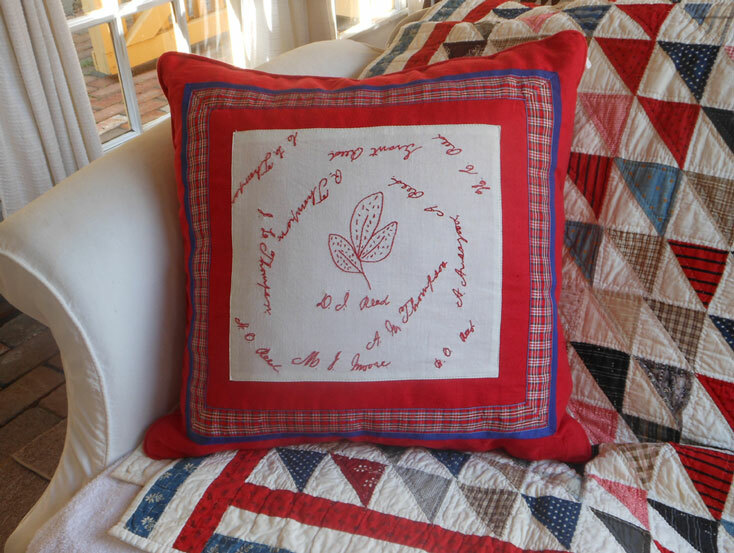 A sporty red plaid ribbon accentuates the sweet Redwork leaf embroidery on this pillow - please see the detail pictures. A lovely mix of antique and contemporary - each pillow is unique. An amazing find, this quilt's focus is the 1893 Chicago World's Fair, also known as The World's Columbian Exposition, which was designed to commemorate the landing of Columbus in America. 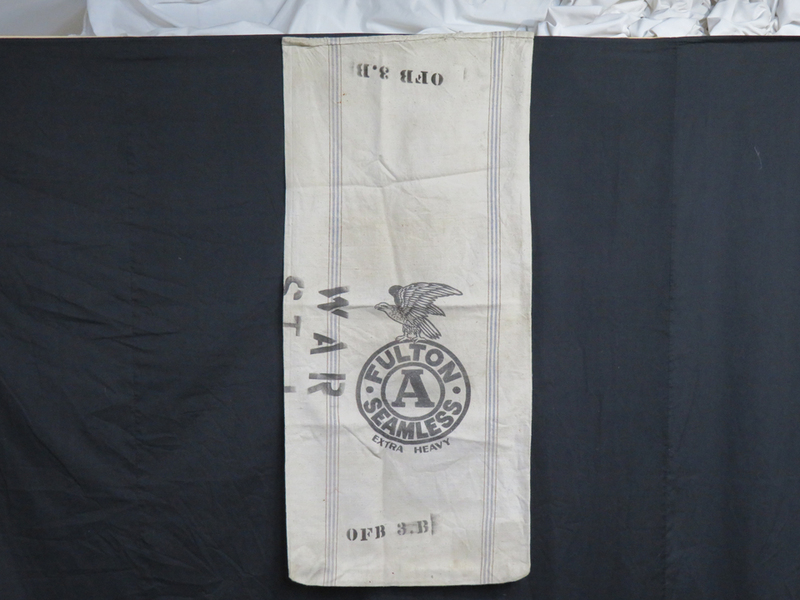 Executed using lengths of printed fabric made specifically for the Exposition for use as bunting, handkerchiefs, and other memorabilia. The front of the quilt is wholecloth; three vertical lengths of printed fabric hand pieced together to create the quilt's top. The 5 ¼ inch burgundy striped border is also hand pieced and folds to the back forming a 1/2 inch hand stitched binding. The quilt has a puffy batting that is smooth and without any shifting, lumps or bumps. 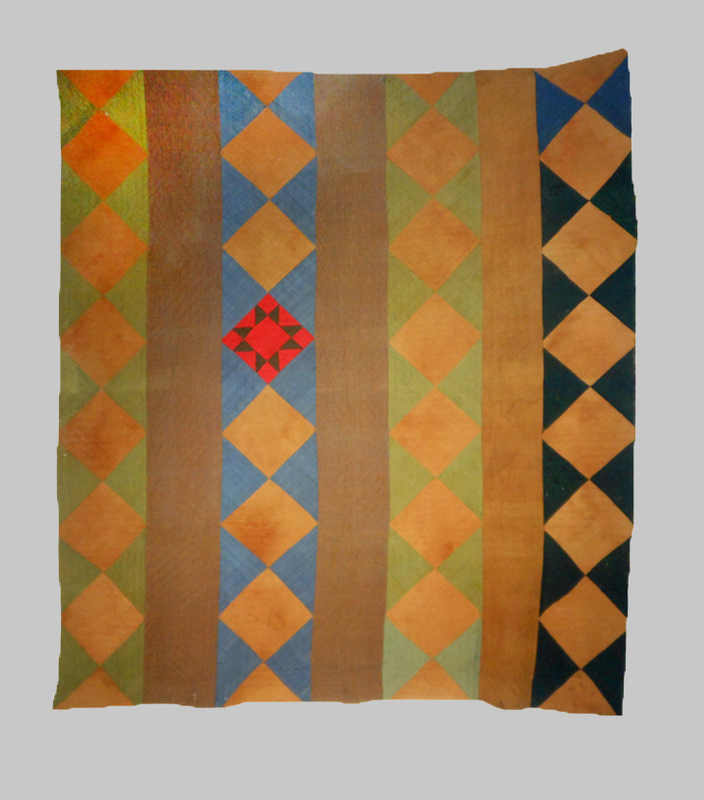 The quilt is top tied using, of all things, thin hemp-like ties that add to the uniqueness and overall design of the quilt. The backing is a great black and red cotton calico-see detail images. 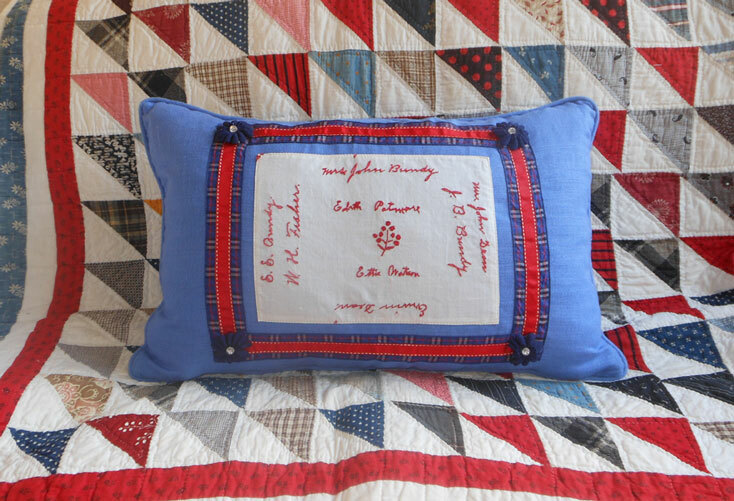 Stitched to the back of the quilt is a hand written note on cotton stating the maker's and recipient's names along with the date of the gift: December 25, 1893. There is an interesting side note regarding the history of the 1893 Chicago World's Fair itself. The Devil in the White City, by Erik Larsen, is a nonfiction novel published in 2003 that spans the years surrounding the building of the 1893 Chicago World's Fair. One plot line centers on Daniel Burnham, the architect who built the 1893 Chicago World's Fair. The other plot line focuses on character H.H. Holmes, the serial killer who exploited the fair to find his victims. Dr. Holmes built a hotel for exposition guests which he named The World's Fair Hotel, and then preyed on his hotel guests, mostly young women. He was convicted of 27 murders, but they expect he had up to 200 victims most of whom were disposed of in the kiln in the basement of the hotel. Good grief. As mentioned, an interesting side note to the 1893 Exposition and its history! Our lovely quilt remains unmarred by any connection to the more gruesome aspects of a marvelous and historical exposition. 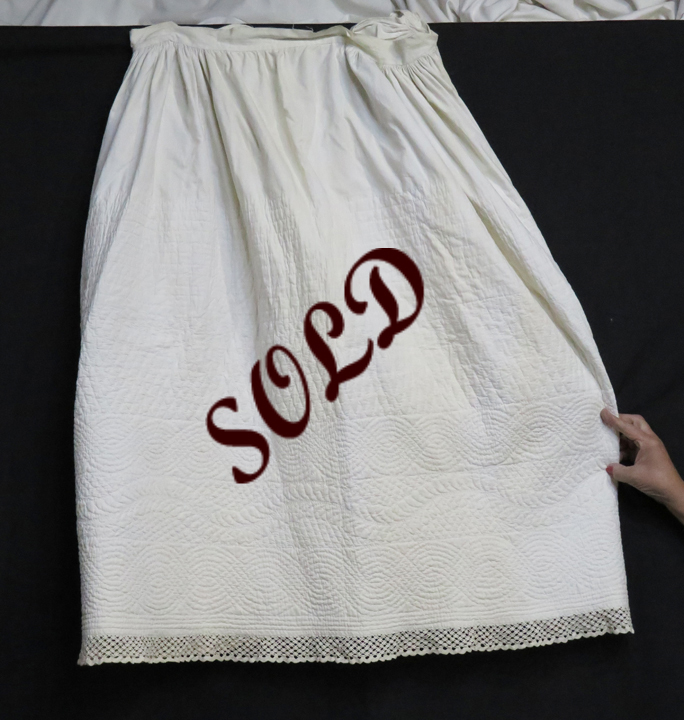 We can assume our talented quilt maker, whose name will go to the buyer upon sale, chose other accommodations during her visit to the 1893 Chicago World's Fair. 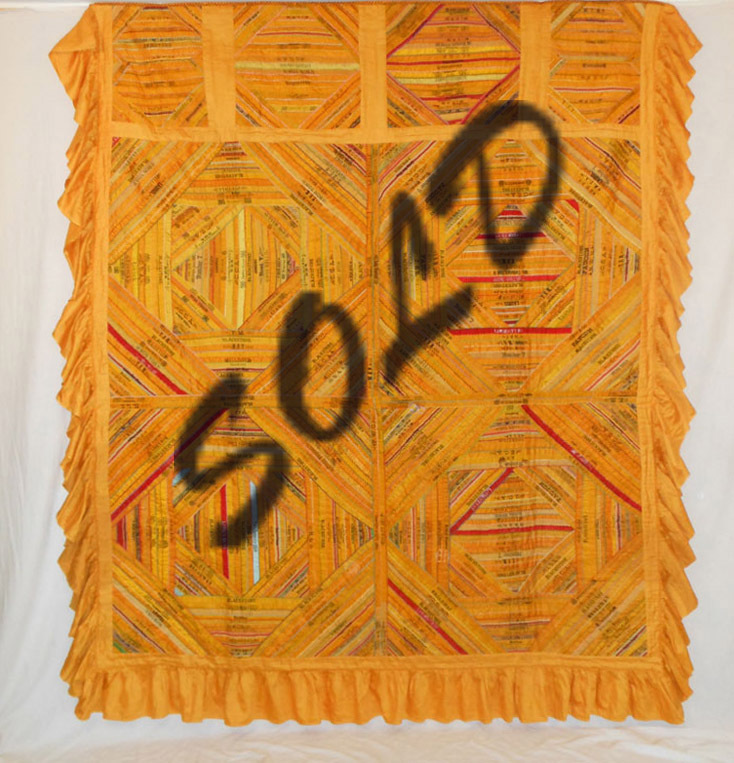 This unique quilt has been professionally hand washed by Betsey, is in excellent condition, and can be shipped to you on approval for private viewing. Please ask Betsey for more details. This quilt already has sleeves sewn on the back in case you would like to hang it as art on a wall. 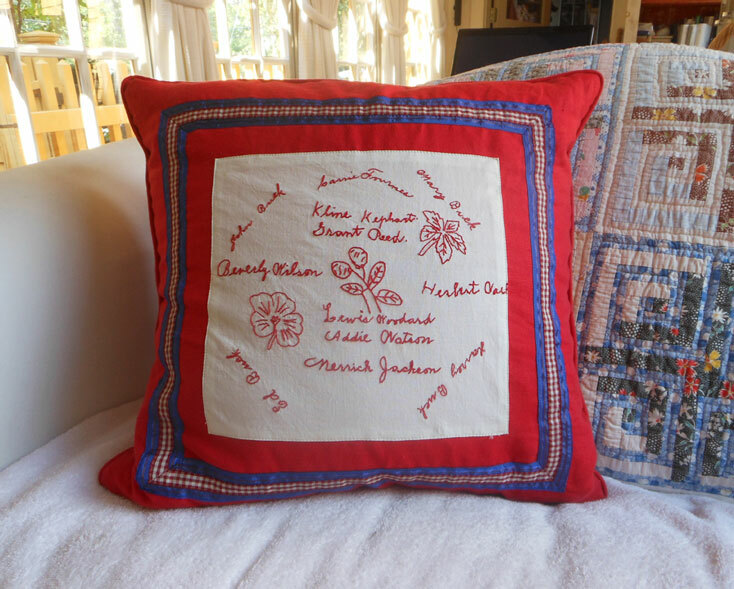 Such a great pillow newly made from early homespun. Feather filled with three antique Mother-of-Pearl buttons used for the closing. We didn't know which way to photograph it and finally chose the side with the buttons. The detail image shows the other side. Beautifully made, there is a 2 inch lip including a 5/8 inch fringe around all four sides so the feather insert is 20 x 20. Just lovely. This is a wonderful and original folk art creation. Hand embroidery, beadwork, 3 dimensional and silk velvet appliques on black wool depict a Native American with bow and arrow next to a fallen deer. Whimsical enlarged flowers with beaded stamens and centers look more like trees in scale! A large yellow butterfly has intricate beadwork and hovers over 3-D flowers with glass jewel centers. The completely embroidered Native American hunter has glass beads for eyes and a graduated beaded necklace. His moccasins are felted wool and contain delicate hand embroidery work. The backing is green cotton flannel with narrow yellow and white stripes and the piece has a nice pillowcase edging for a clean look. An original piece in excellent condition, we found one hard to find tiny moth bite in the black wool near the edge seam. See detail images of this spectacular piece of original folk art. 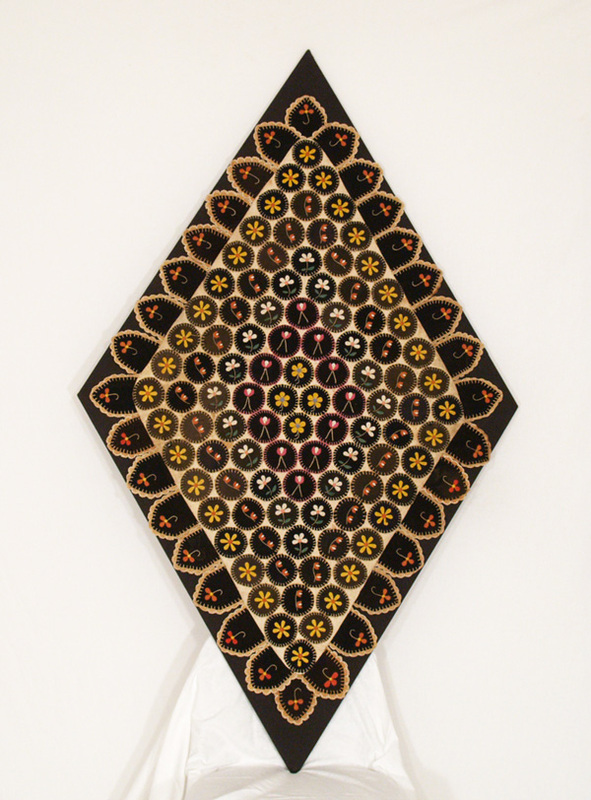 A unique Folk Art piece comprised of silk tobacco premiums appliqued onto black silk with silk embellishment stitching. American tobacco companies produced a wealth of tobacco premiums that were included free with tobacco products. 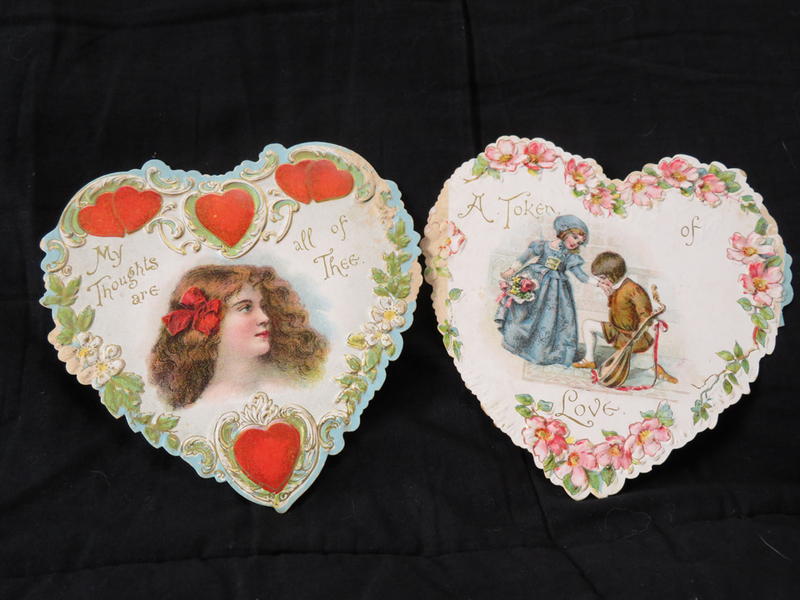 The advertising scheme encouraged collecting and creating household decorative items out of the premiums and was specifically targeted not to the users of the tobacco but to their wives, daughters, mothers, etc. They became extremely popular for collecting from 1910 to 1916. 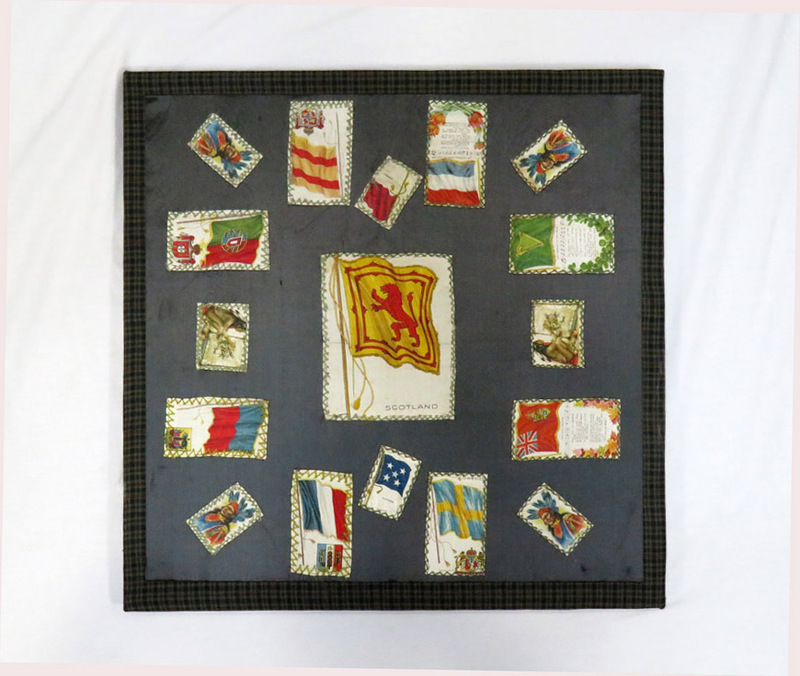 This particular piece consists of a center silk Scottish Flag measuring 5½ x 6¾ surrounded by additional Country Flags, and Native American silks either 1¾ x 2¾ or 2⅜ x 4 in size. Mounted on a wooden frame wrapped in a wool plaid. A wonderful folk art piece ready for hanging.